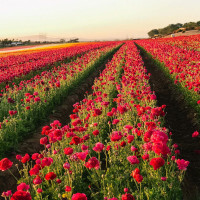 Spring arrives with the superbloom in California and suddenly it feels like the year ahead is rife with possibility. Not sure what to do with yourself in celebration? Here are some of our best suggestions. 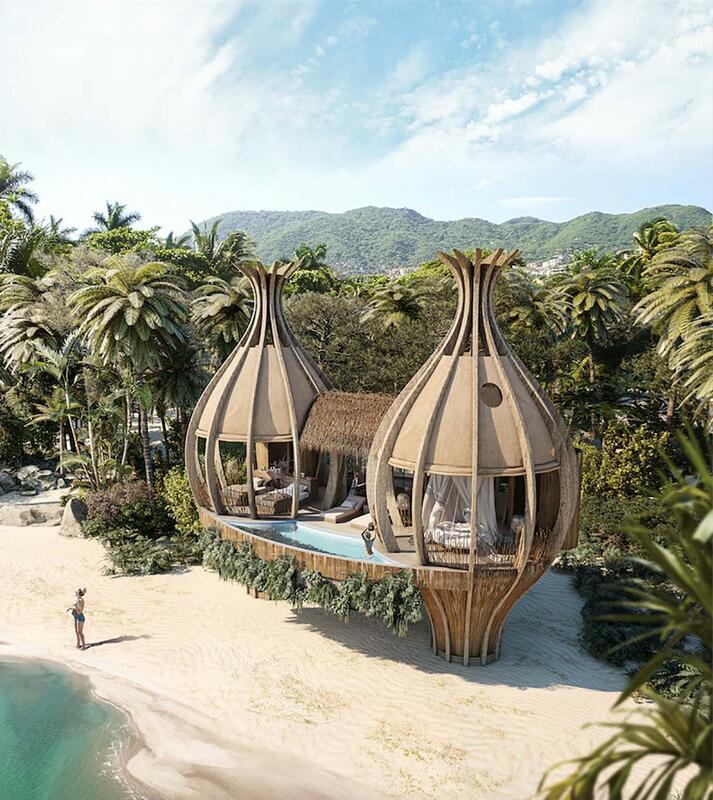 You can gather your friends and adventure off to Mexico to sleep in human cocoons on the beach. 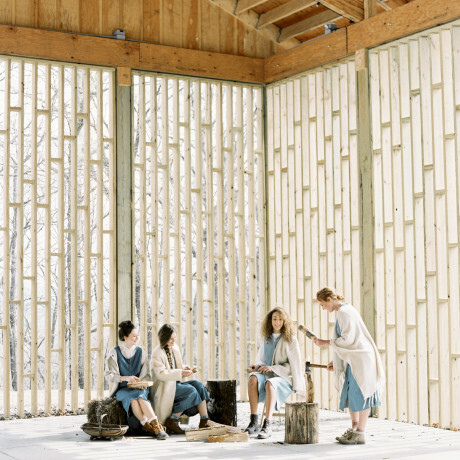 You can meet up with your family at a Design Hotel in the Swiss Alps. You can sneak off to the French countryside to host a game-changing photography workshop. You can renew your wedding vows in the orchards and deserts surrounding San Miguel de Allende. 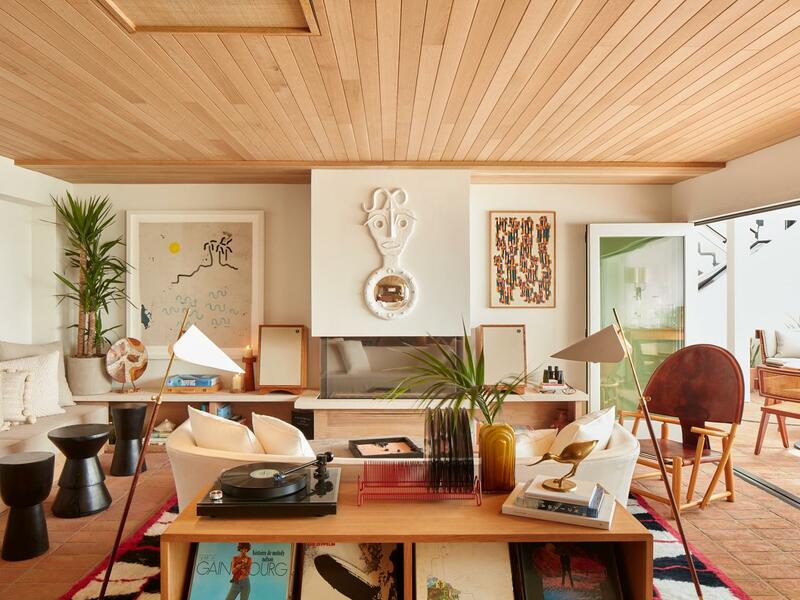 You can make new friends while staying in a 1970s glam inspired Sydney guesthouse. 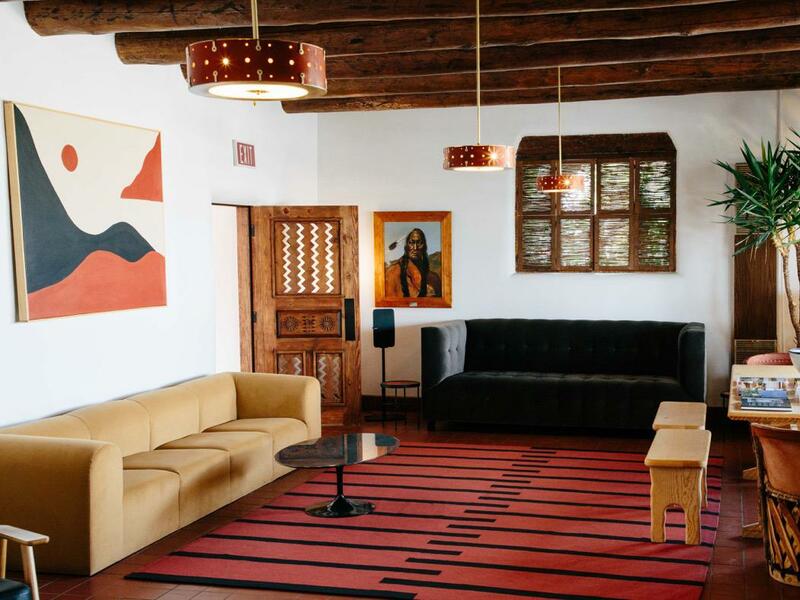 You can even make your next business meeting a little more soulful by hosting it in the Sonoran Desert. 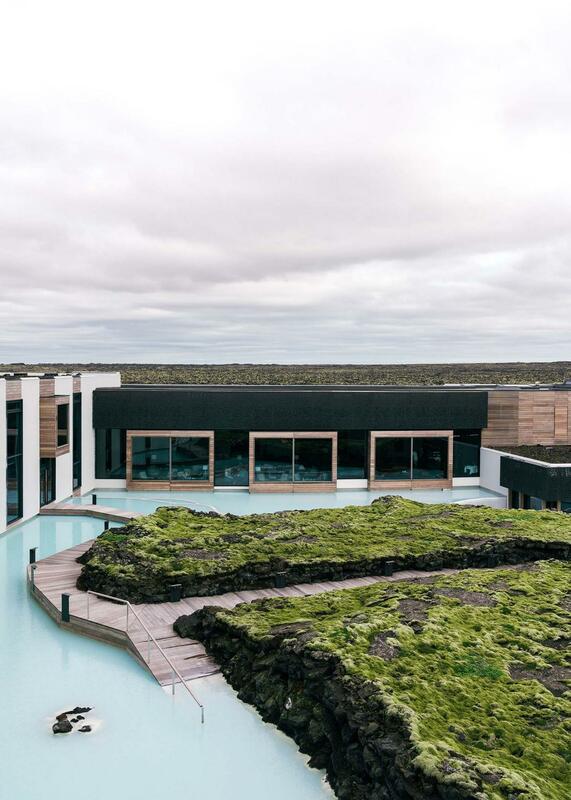 And yes, we’ll tell you exactly where to go for each one of these experiences as we introduce you to some of the most exciting new hotels around the world. 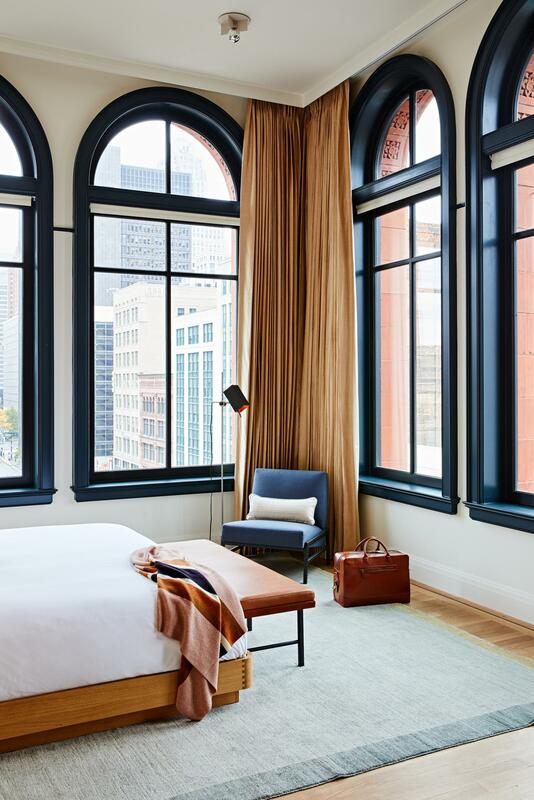 Detroit’s new Shinola Hotel has all our favorite things: 129 beautifully designed rooms, a bright conservatory space with glass-vaulted ceilings, various event spaces, a private Italian dining room, an American beer hall, and a fried chicken spot. All that, and the service level is friendly and approachable. 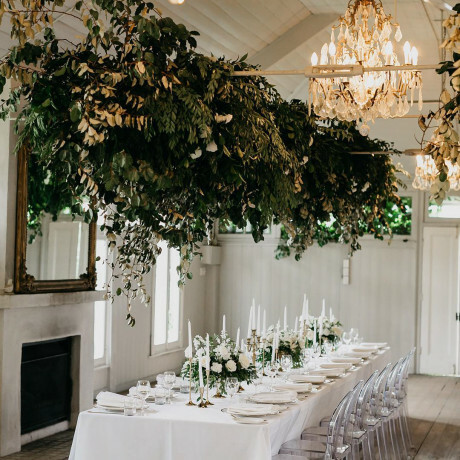 Good for groups: wedding ceremonies in what feels like a greenhouse, receptions in a stunner of a ballroom space, meetings and corporate events, private dinner parties, anniversary celebrations, parties of all styles and sizes. Or, for the easy-to-please group of friends, just swing by for a fried chicken dinner to celebrate a weekend. 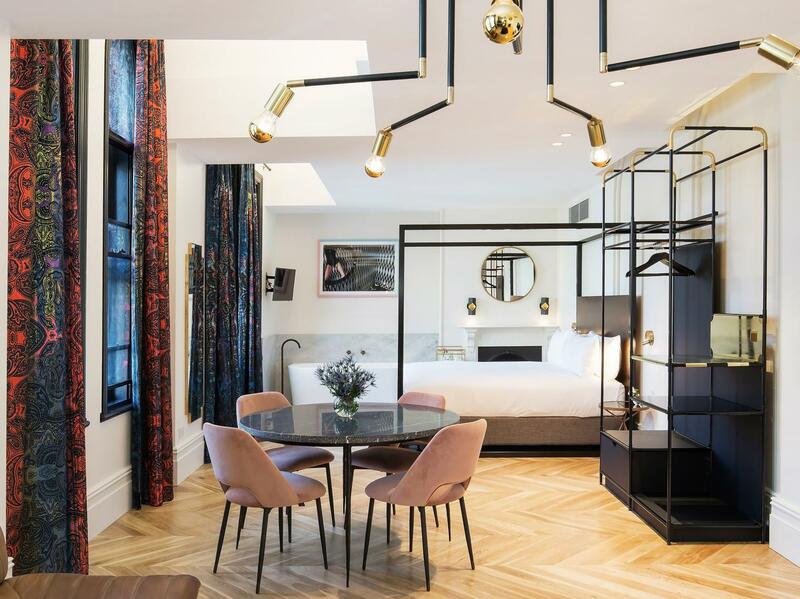 Fortitude Valley’s James Street sets the scene for this gorgeous new hotel with perfectly curated suites surrounded by high-end retail shops. The Calile Hotel comes complete with a library, pool deck with cabanas, spa, and both a lobby bar and a Greek restaurant. Good for groups: get your group together and dine inside, outside or poolside at Hellenika Greek Restaurant & Bar. 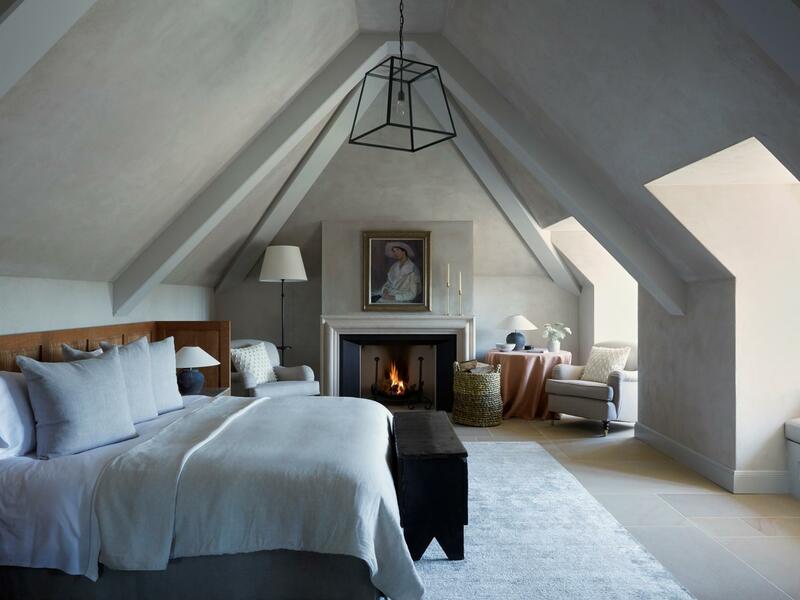 Nestled in the tree-filled hills of the Berkshire Mountains, this modern hotel celebrates all things old and new in Berkshire culture. The suites are cozy, with beautiful views and cozy nooks, and the grub is good at the lodge, deck bar and the circa 1813 farmhouse. 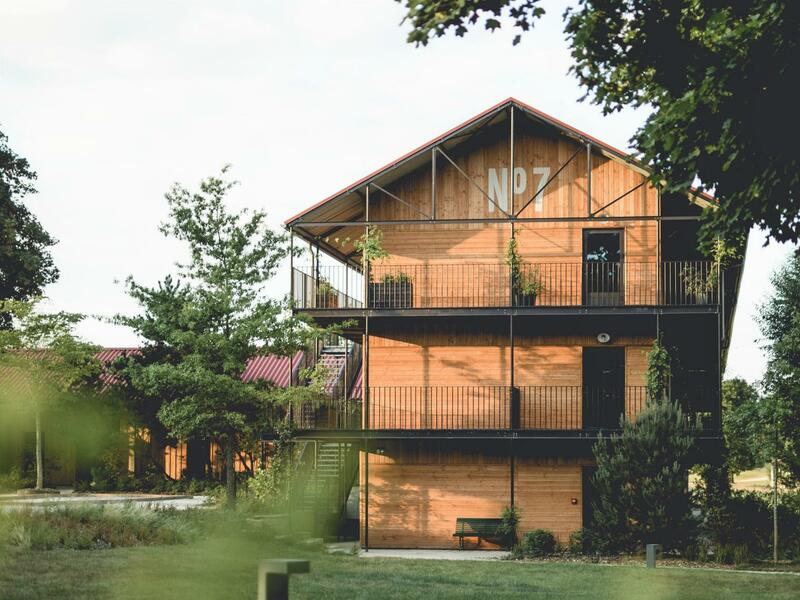 Good for groups: the farmhouse, known as the airport rooms, is a brand new addition to the hotel and doubles as party space for those hankering to gather a crew. 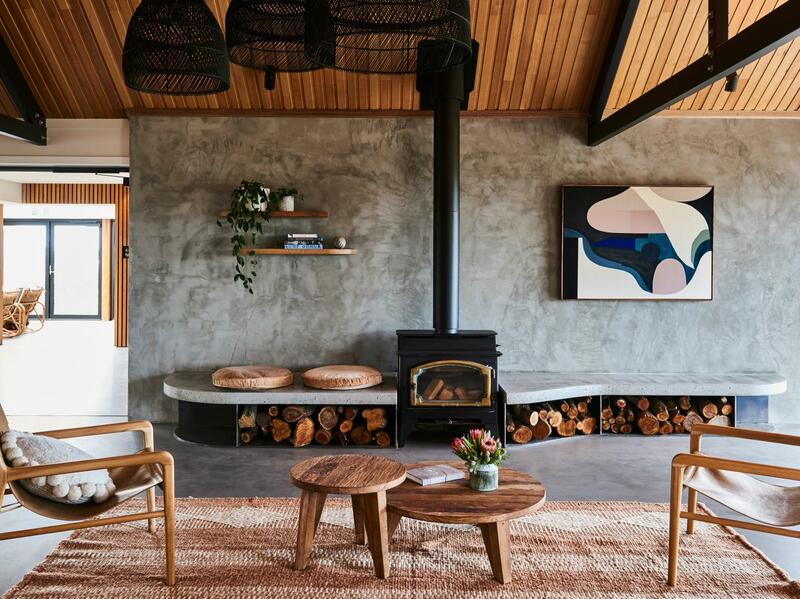 Located on the Bellarine Peninsula just outside Melbourne, Lon Retreat and Spa opened in October 2018. Here, seven glass-walled suites set on a family farm look right out to Port Phillip Bay. Spa goers will enjoy the mineral water fed soaking tubs, steam rooms, and mineral water sourced heated pool that leads out to a sunroom, gardens and sundeck. Good for groups: keep an ear out for yoga and wellness retreats. Intimate events and weddings of up to 120 guests can also be accommodated. 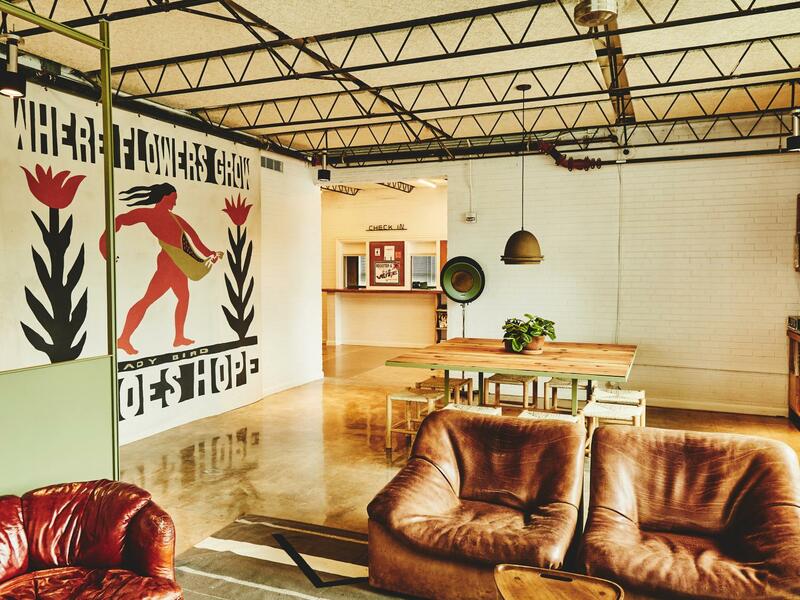 Austin seems to be the epicenter of the small hotel movement and this spot is not one to overlook. The Carpenter Hotel is well designed and has a cool, modern cafe and a great pool deck with a private event space. 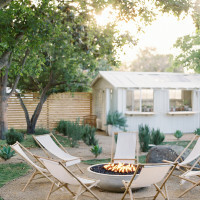 Good for groups: there’s an all-in-one courtyard, pool deck and cabana that makes a great setting for bridal and baby showers, small rehearsal dinners, and outdoor cocktail parties for a small group. Clad in serrated terracotta and glass, London’s Manhattan Loft Gardens is an architectural sight to behold. The mixed use structure combines 248 residential apartments, a 146-room design hotel, three sky gardens and two restaurants. Good for groups: the three-level lobby and social hub should be at the top of your list if you’re planning something special. 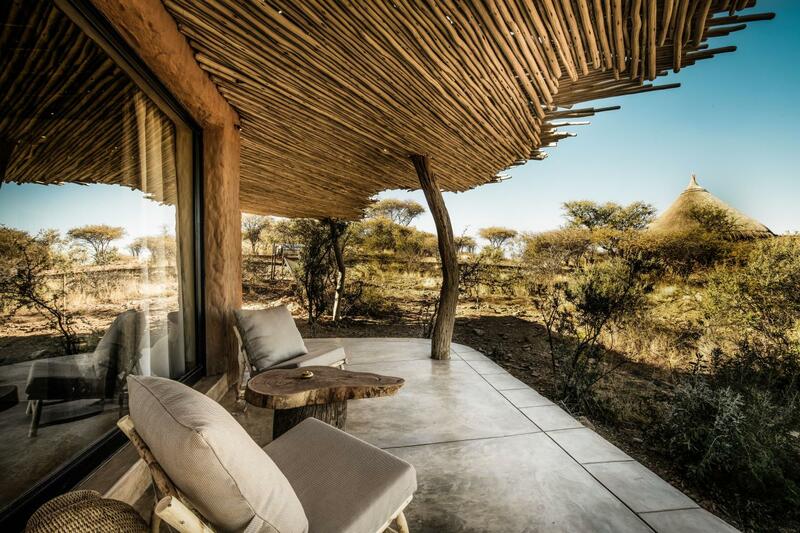 Ten comfortably decorated round thatched huts sit on a savannah overlooking the Zannier private reserve by N/a’an ku sê in Namibia. 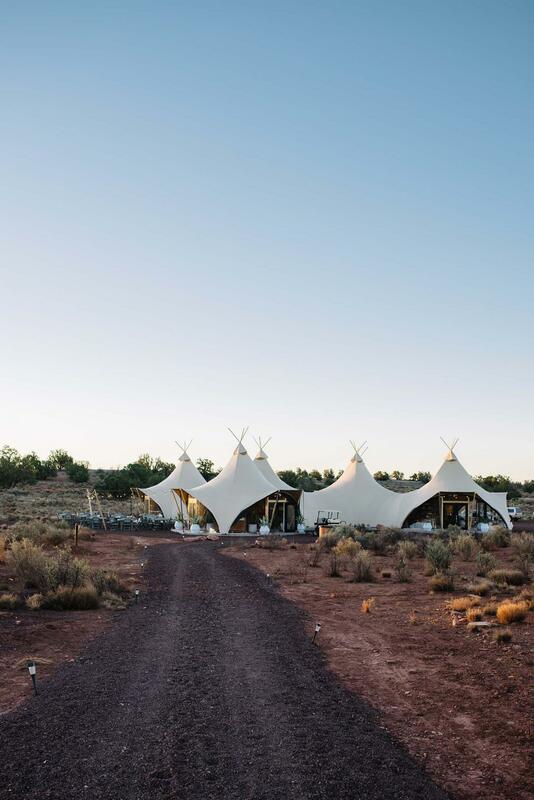 The camp’s primary focus is on the natural environment, introducing visitors to a safari experience that’s more about immersion than about jam-packed agendas. Good for groups: group getaways to this place would be legendary. There’s also a bar and an infinity pool overlooking the savannah, and you better bet you’ll be spending lots of time in these areas hanging with your travel companions. 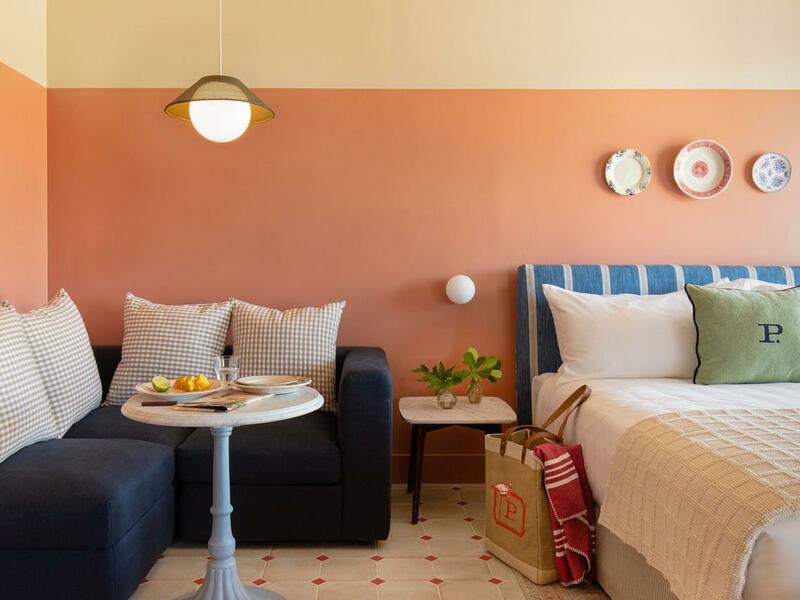 Bannisters Port Stephens takes an original 1960's era motel and flips it upside down with modern rooms, outdoor/indoor dining spaces, a beer garden and a fresh outlook. Good for groups: the infinity pool terrace sure would be a nice place to have a cocktail party. 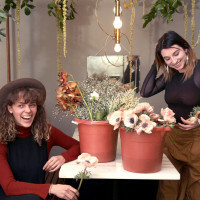 Located in the heart of the flower district, this new Moxy property opened on Valentine’s Day. 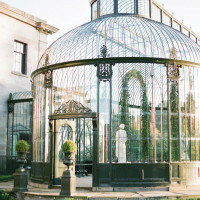 Guests enter through a Putnam & Putnam flower shop before making way up to a three-story glass atrium filled with plants. 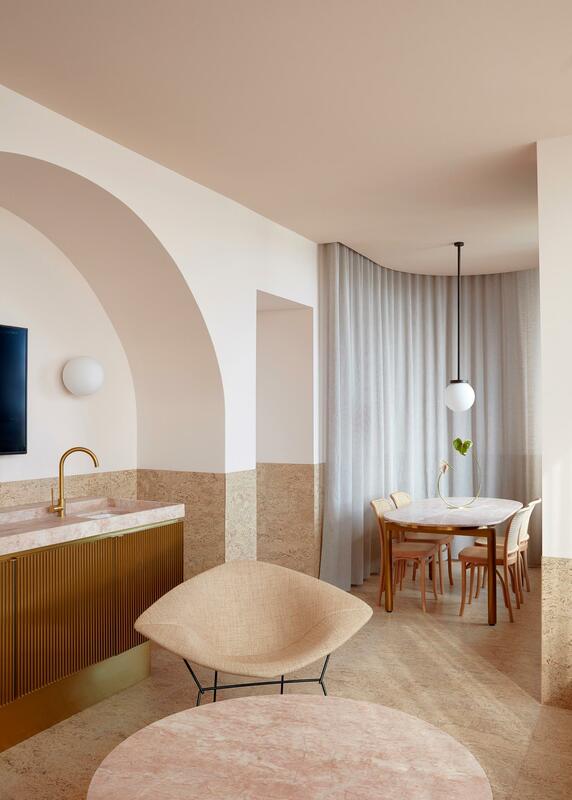 There are 35 stories of modern, light-filled guest rooms and there’s a Roman style café, an Italian restaurant and snack bar, a garden terrace, and a rooftop lounge. The Grand Powers has stood strong in the heart of the Parisian Golden Triangle since 1920. Recently reopened following a renovation, the updated rooms and suites feel rich and timeless while the event spaces in Cafe 52 and Salon Eugene can be joined to create a customized private event. Good for groups: with the cozy rooms and luxe spa, this place would be a great destination for a bachelorette party, girls’ getaway or an intimate destination wedding. 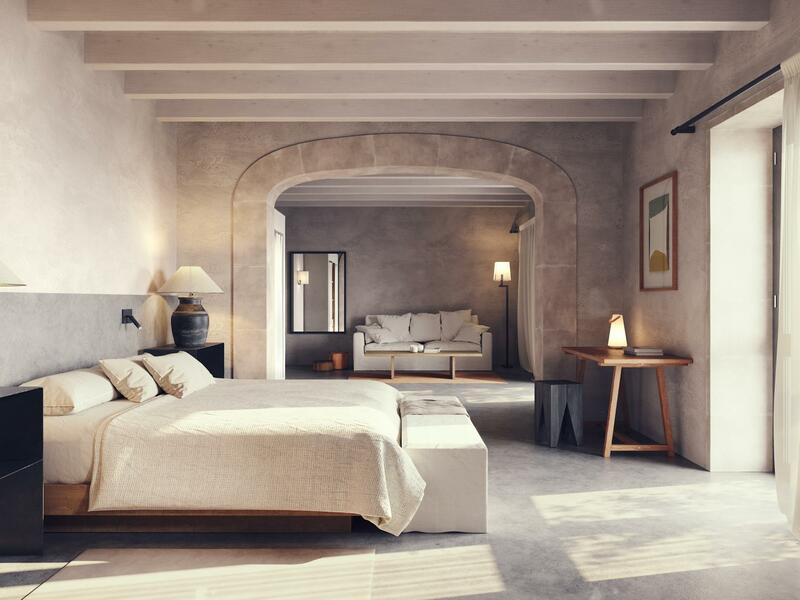 A sophisticated luxury guest house by the team behind the Ace Hotel brand, Maison de la Luz aims to open in April with 67 lavishly decorated suites, a beautiful breakfast room and a spacious lounge. 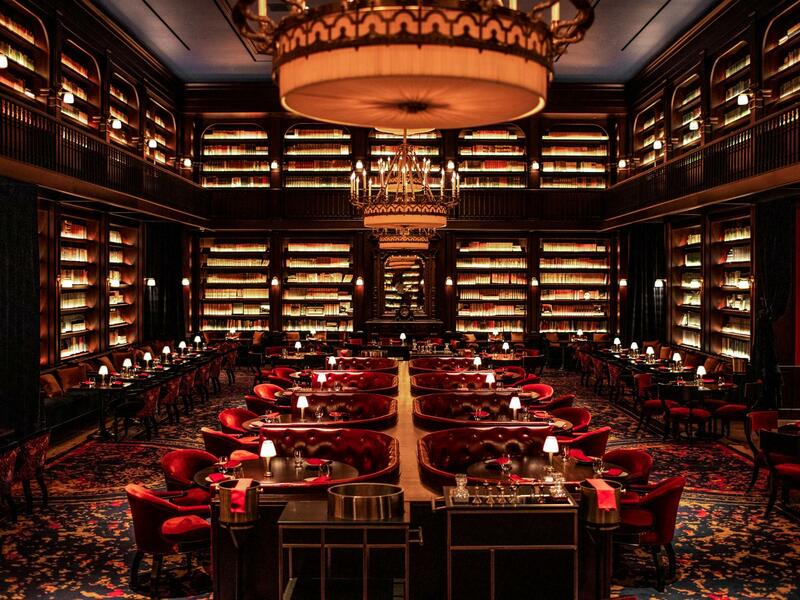 Guests will have access to a private craft cocktail bar that’s housed in City Hall’s historic library. Good for groups: while there are no large event spaces here, small groups can coordinate private dining in the lounge while larger groups will have access to event spaces across the street at the Ace Hotel. 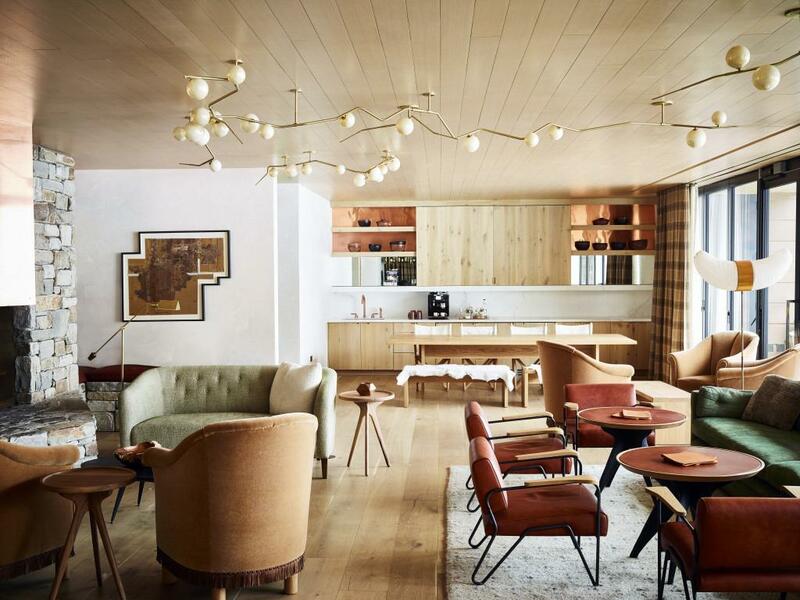 Plush lounge areas, bold color palettes and ski-in, ski-out access to the Swiss Alps have already made this Design Hotel a favorite destination for many. The lounge centered around a mod fireplace makes a great hangout spot and the restaurant and deli are equally fab too. 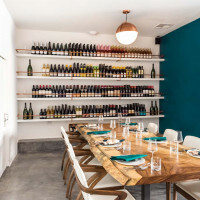 Good for groups: you won’t find any designated event rooms here but the restaurant is a great spot to host a group dinner with your ski buddies. Grown gardens, woodlands and farm set the scene for this bucolic country haven in Hampshire. 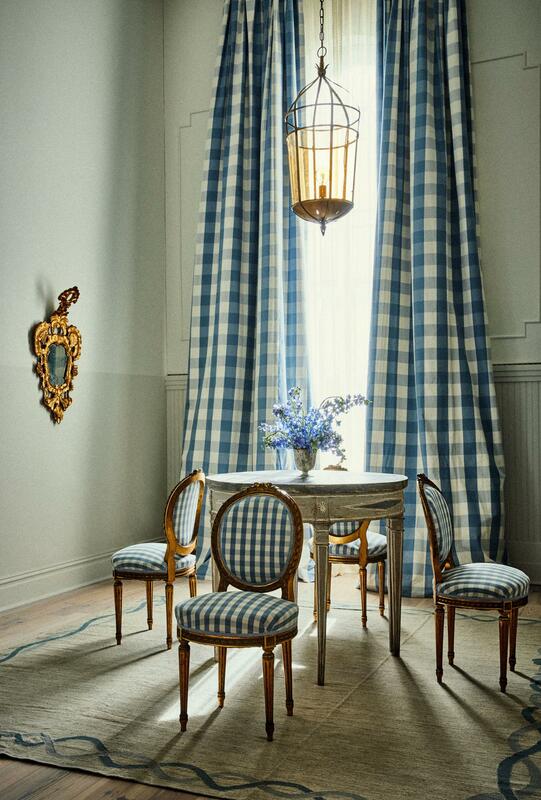 The historic Georgian mansion is filled with beautiful rooms designed with 20th century Georgian furnishings and original British artworks. 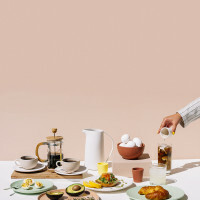 There’s a spa with all-natural treatments on the menu, two restaurants that celebrate simplicity and the bounty of the seasons, a wine cellar and bar, and a stunning private dining room. Good for groups: the private dining room works well for dinner parties, afternoon tea or extravagant luncheons. The largest apartment on the property, the Long Room, has its own kitchen, private terrace, balcony and large dining room that works well for a small, contained gathering. 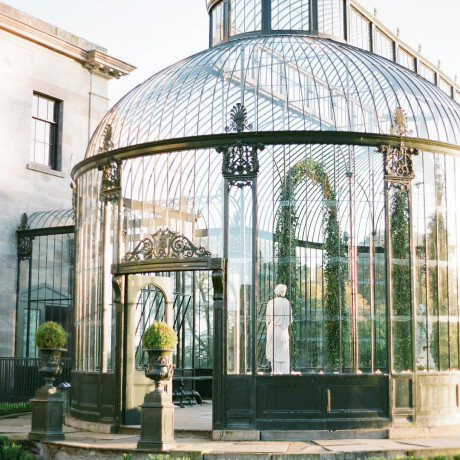 Weddings and larger groups should look to the sun house, a greenhouse space that can be used as a party spot, and the Assembly Room, which overlooks the gardens and can be modified to suit groups of different sizes. 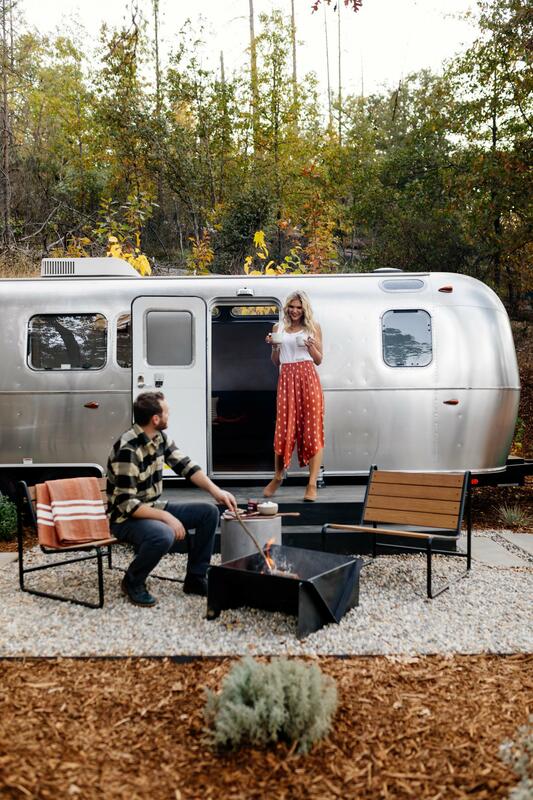 Customized Airstreams, modern cabins, cozy glamping tents and accessible cabins are all on offer at this Yosemite AutoCamp. 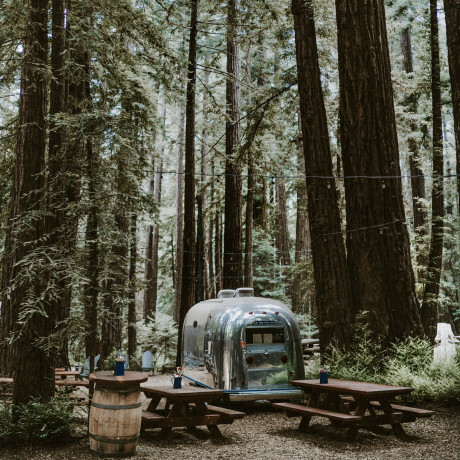 There’s also a pond, heated pool and a daily shuttle service that’ll take you right to the entrance of Yosemite National Park. 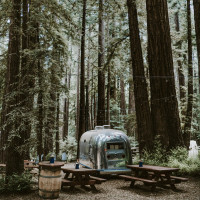 Good for groups: book a base camp site and you can bring along four of your nearest and dearest to share a large tent and Airstream site with your own deck and firepit. We’d love to see an outdoor dinner party on the grounds! On the northern stretch of the Yucatan Peninsula, Isla Holbox is a small island surrounded by turquoise waters. On the island sits this five-room villa that can be booked by the room or taken over with a party crew. Good for groups: best for a group getaway in the name of celebration or wellness. 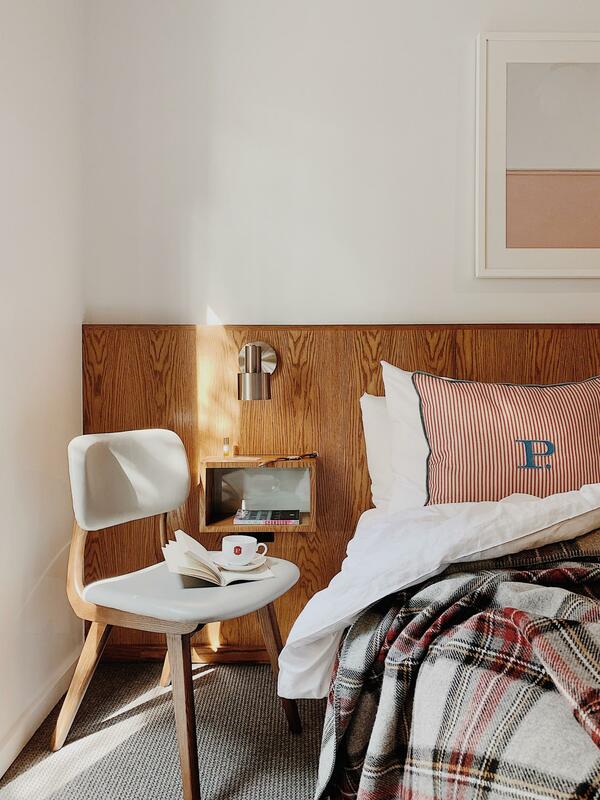 Set to open this spring, Palihouse Miami Beach’s residential-style rooms and studios have a homey feel that includes kitchenettes in most of the rooms. This spot will be home to Greenbrier Swim & Social, an all-day pool and patio drinking and dining spot you can’t miss. 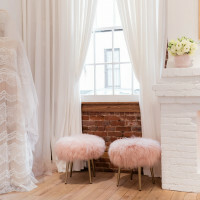 Great for groups: the blush-colored rooms scream bachelorette party central! 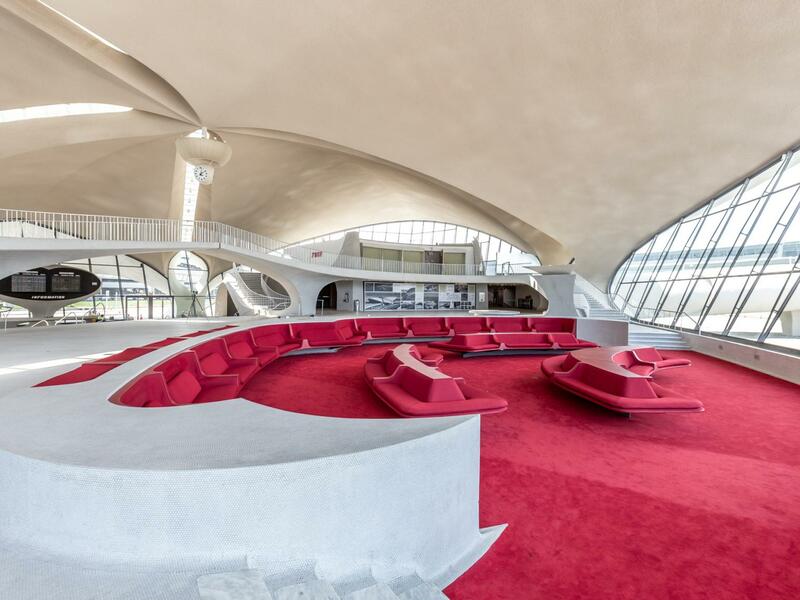 The iconic mid-century Eero Saarinen terminal at JFK will be ready to reopen in mid-May as a sprawling hotel with multiple restaurants and venue spaces. 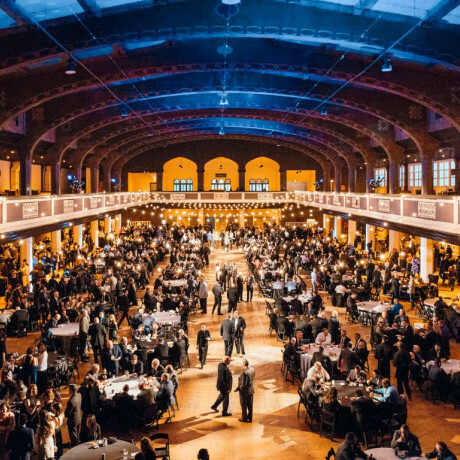 Ballrooms, meeting spaces, skyboxes and cocktail lounges are all options for events of as many as 1,600 guests and the dining program at Paris Cafe and Sunken Lounge are headed by celebrity chef Jean-Georges Vongerichten. Good for: award ceremonies, corporate events, conventions, movie premieres, galas, trade shows, weddings with an authentic 1960s feel. 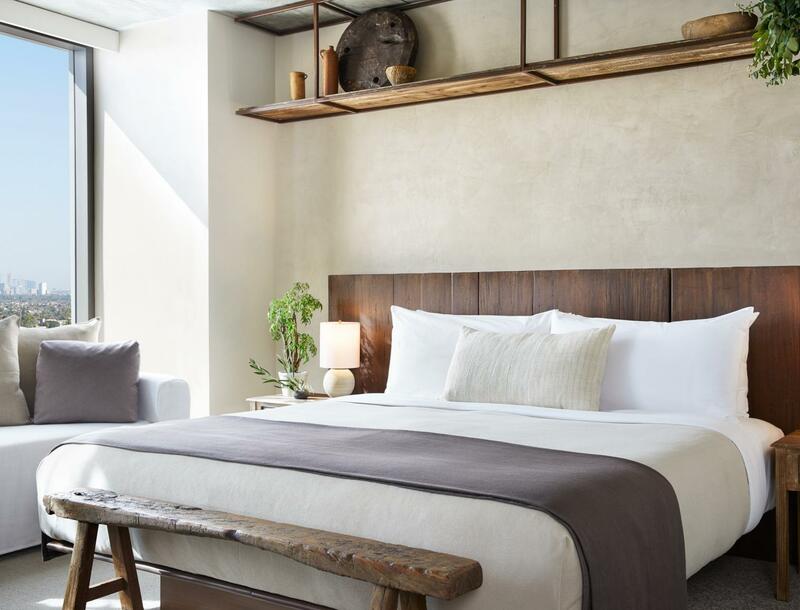 Portland’s new shining star of the hotel scene, The Woodlark offers rooms that are modern, luxurious and effortlessly chic. Event spaces here are far from stuffy and offer comfy lounge areas, natural light and lots of flexibility. 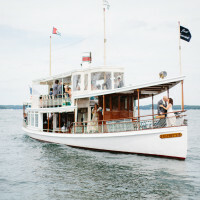 Good for groups: weddings, product launches, pop-up shops, corporate off-sites, meetings, rehearsal dinners, cocktail parties, birthdays, creative workshops, dinner parties, and board meetings are some of the possibilities. 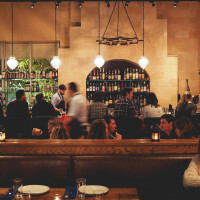 We really love it for group dining at Bullard followed by a nightcap (or a few) at the beautiful cocktail bar, Abigail Hall. 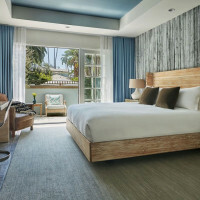 If it’s anything like its eco-friendly sister hotel in Brooklyn, 1 Hotel West Hollywood is sure to be a stunner. 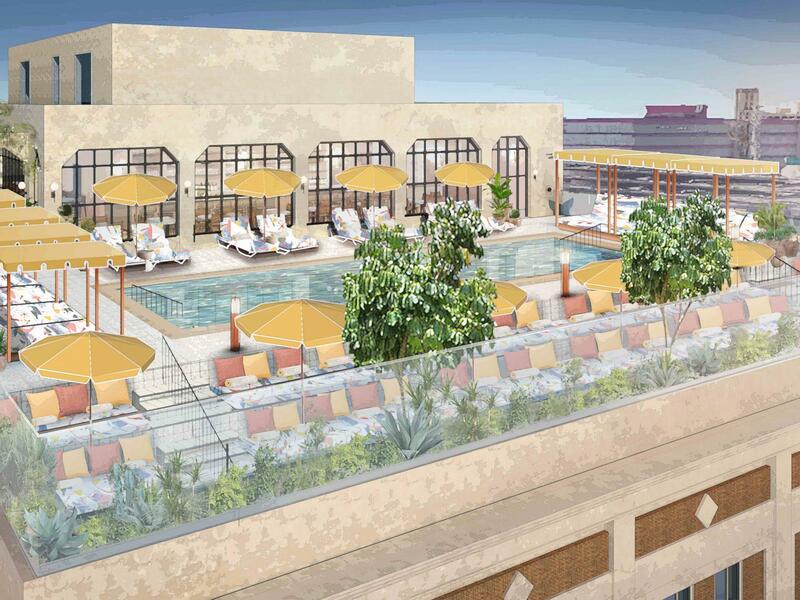 Set to open in early May at the corner of La Cienega and Sunset Boulevard, the 285-room hotel includes a couple of incredible penthouse suites, a pool deck overlooking the city and a stylish rooftop cocktail lounge. Good for groups: With three ballrooms, a rooftop bar, a large outdoor garden space and a screening room, gathering options abound for groups of up to 820 guests. 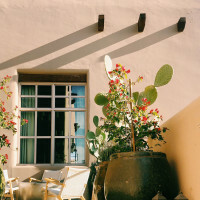 For something smaller, like a girls’ getaway or staycation, check out the connecting suites with living rooms and balconies. 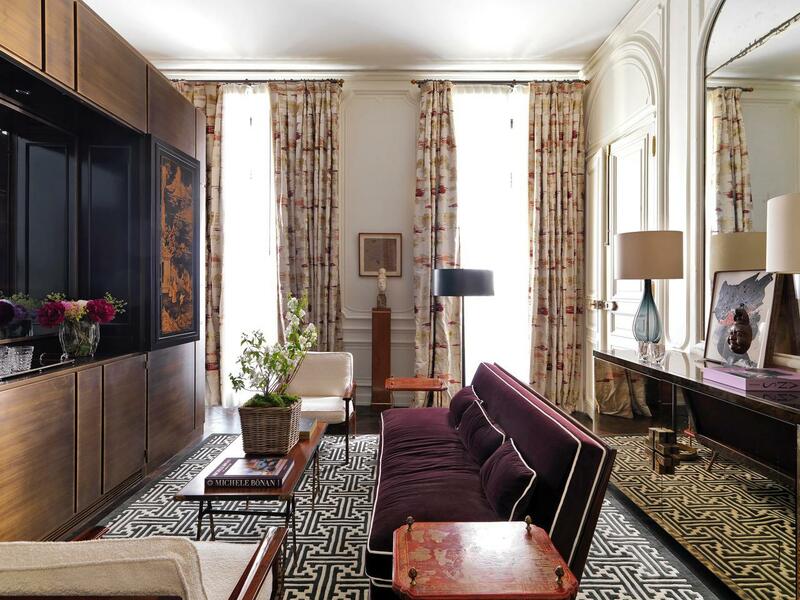 Lavishly decorated rooms designed by Michele Bonan are sure to light up the radars of Paris Fashion Week’s traveling set. 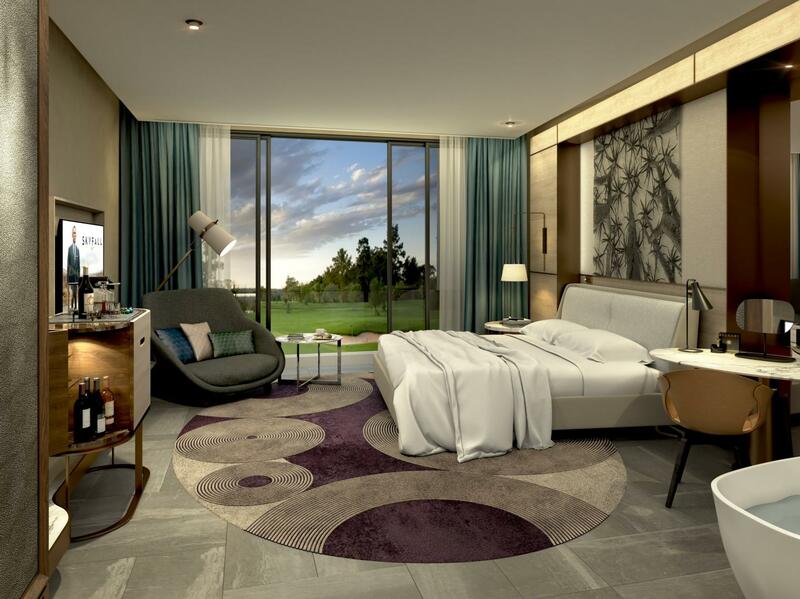 Scheduled to open this spring, JK Place will also house an Italian restaurant, lounge bar, indoor pool and Sisley spa. 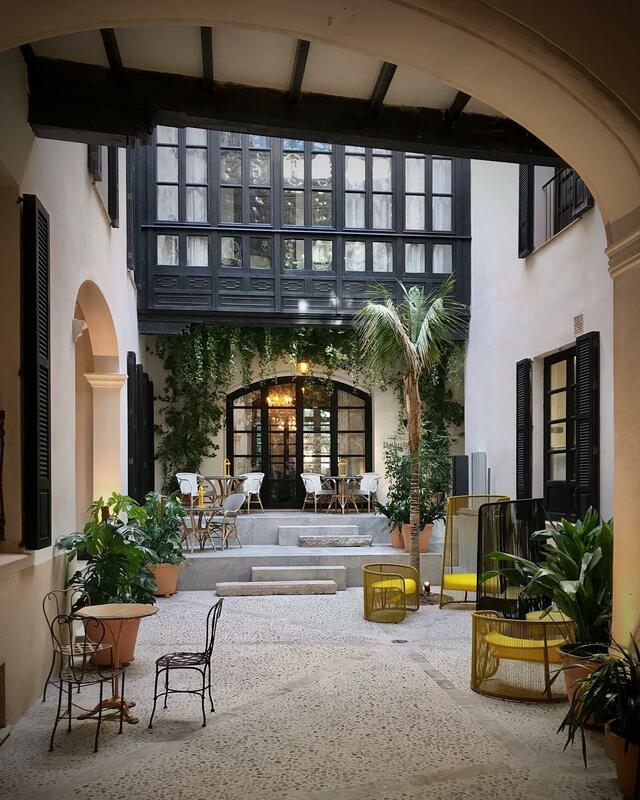 Good for groups: this place should be at the top of the list if you’re planning a girls’ getaway to Paris. Ski-in, ski-out is a necessity in Teton Village and Caldera House offers that plus absolutely gorgeous rooms and gathering spaces throughout. The members lounge is a space guests can take over for a private event of up to 80 guests, but there’s also a restaurant that works well for semi-private dining and smaller events. Good for groups: intimate weddings, engagement parties, bridal or baby showers, rehearsal dinners, girls getaways, corporate events and retreats, wedding brunches or luncheons, dinner parties. This stunner of a Caribbean resort just recently reopened following a complete rebuild due to Hurricane Irma. 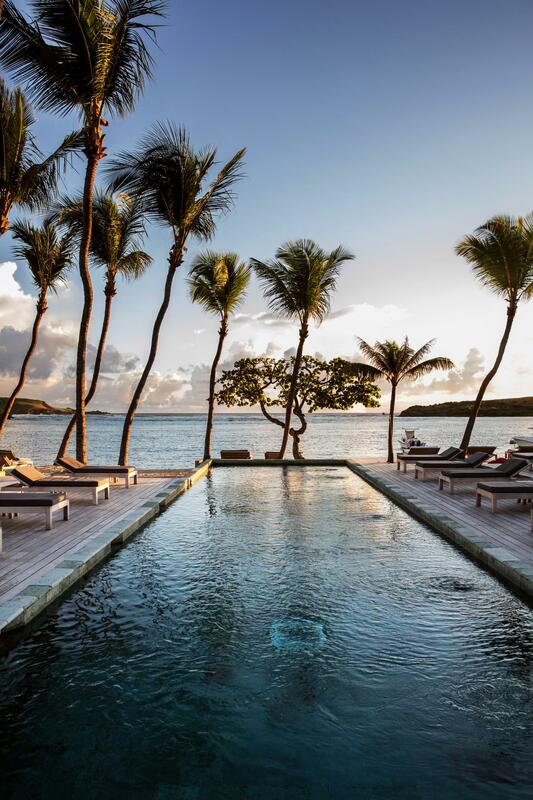 Nestled in the private Grand Cul de Sac in St. Barths, the collection of suites and villas range large and small. There’s a spa, two restaurants and a bar/lounge zone on the beach. 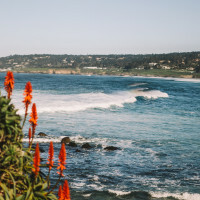 Good for groups: hotspot for group getaways with friends, bachelor/ette parties, wellness retreats, weddings, vow renewals, conferences, meetings of the minds. What was once a place only for royalty is now a destination hotel that’ll have you feeling like royalty. Queen Kapiolani sits alongside the best surf break in Waikiki, right on the edge of Kapiolani Park near Diamond Head’s Summit. We say all this to say that the views are incredible, of both mountains and ocean. 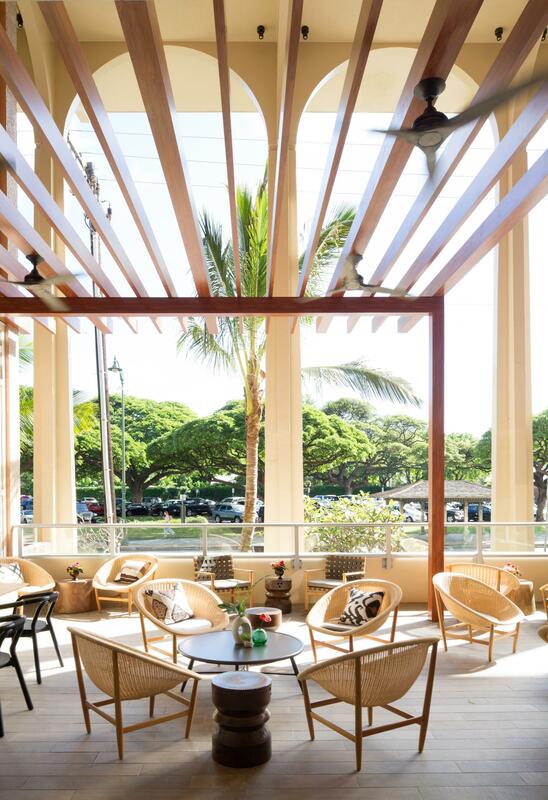 Good for groups: if you’re planning a wedding or event for up to 275 people, check out the Leahi Lanai terrace space overlooking Diamond Head and the adjacent ballroom. For smaller groups, poolside events and parties in the Deck restaurant are great options. 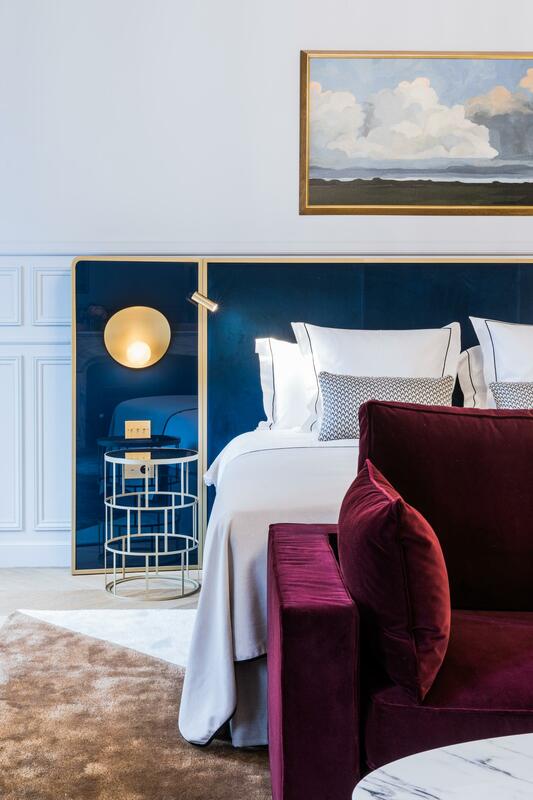 Warm and energetic design meets world traveler style at this new 52-room Parisian hotel. 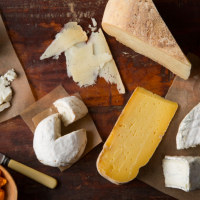 Set in the 16th arrondissement, there’s a bourgeois quality to this place yet it’s far from stuffy. The restaurant, Brach, serves Mediterranean-style fare with a fresh take. The patisserie and the cocktail bar each offer a journey for the palette. 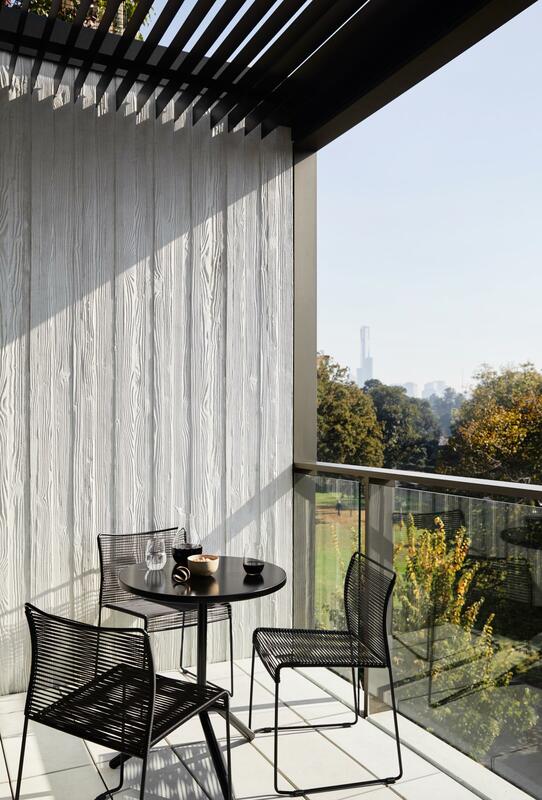 And a new terrace is set to open in April with both lounge areas and dining tables. 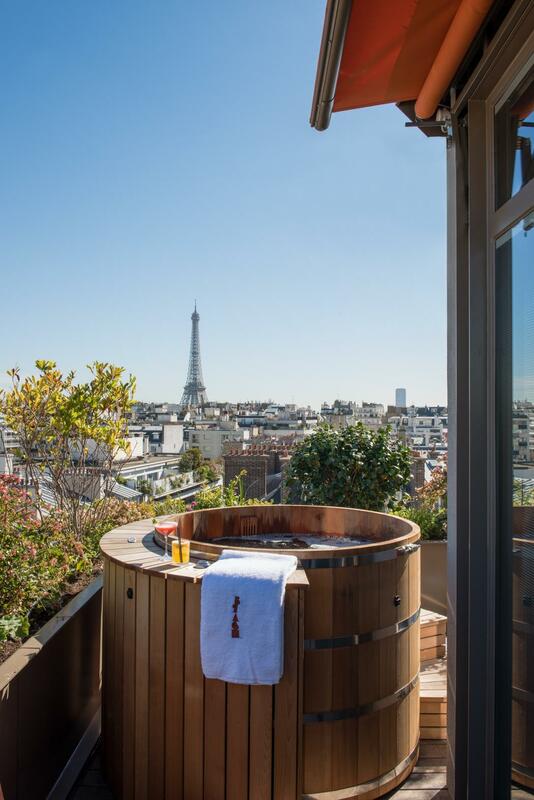 Good for groups: something as simple as an in-room cocktail session or as extravagant as a multi-course meal in the private rooftop garden with views of the Eiffel Tower can be accommodated here. There are seven suites with terraces and sweeping city views that can be used individually or en masse to celebrate a wedding, anniversary party or engagement, a bridal or baby shower, a milestone birthday, a corporate milestone or product launch, and the list goes on. 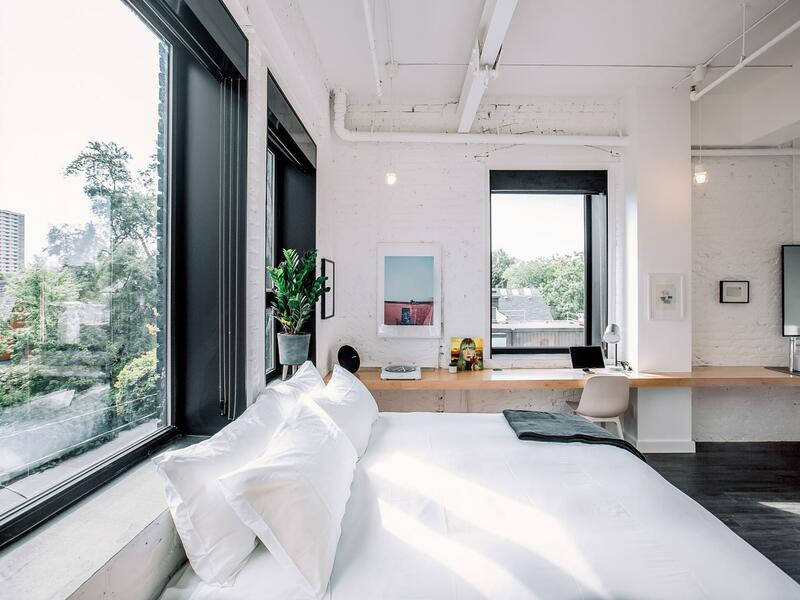 Toronto is made to feel like home at this comfortable, no-frills hotel with great photography and record players in each room. The Annex isn’t the kind of hotel you grew up going to with your parents. It’s so much better. Good for groups: casual pizza, taco or fried chicken hang session in The Commons. Grab a coffee and catch up with your mates in the morning, or head in to taste natural and biodynamic wines in the evenings. 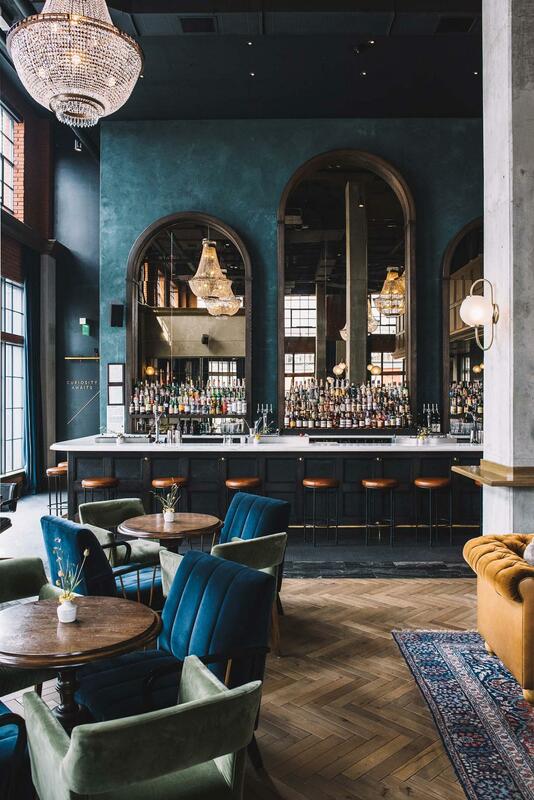 The Hoxton in Portland brings elegant rooms, a big, open and airy lounge-like lobby, all-day rooftop restaurant and a basement bar to historic Old Town Chinatown. This spot hosts great in-house events, so be sure to check the calendar when you’re in town. Great for groups: this place is great for group hotel blocks for weddings and events, and ultra-private events can book exclusive use of The Apartment for anything from cooking demos to product launches and pop-ups or cocktail and dinner parties. 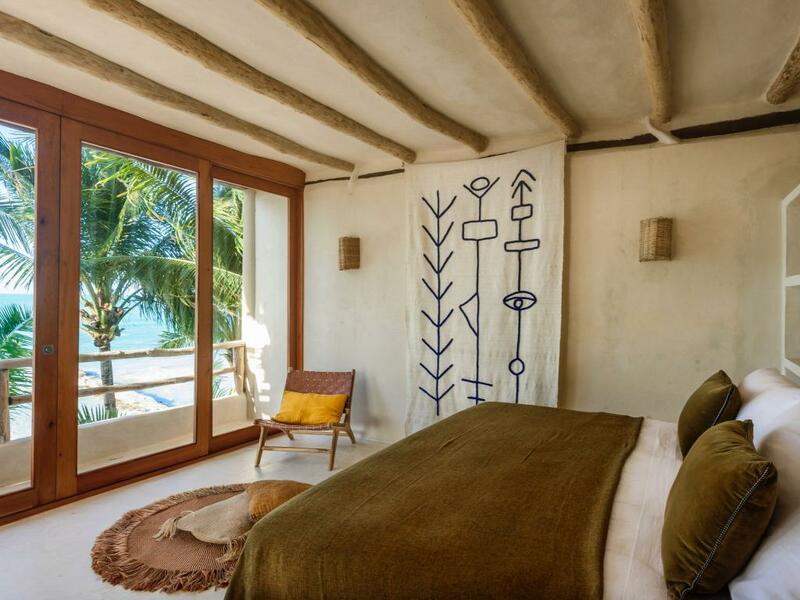 This new luxury resort in Zihuatanejo sits right on the white sands of Playa La Ropa and offers guest rooms with private plunge pools and ocean views. 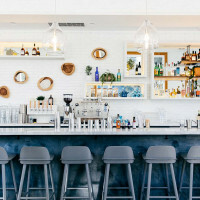 Good for groups: you’ll have a few options for gathering with your crew and dining at this spot, whether you prefer a private sunset meal right on the beach or a meal under a palm-thatched palapa with the breeze blowing and margaritas flowing. 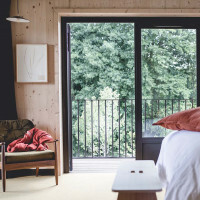 Once a cinema and printing factory, this historic building on the fjord in Akureyri has recently been turned into a 33-suite boutique hotel with fresh, modern style. Good for groups: on the ground floor of the old printing factory you’ll find a cozy bar and lounge that’s a great spot for rallying your troops before heading out on adventures in town or in the nearby mountains. 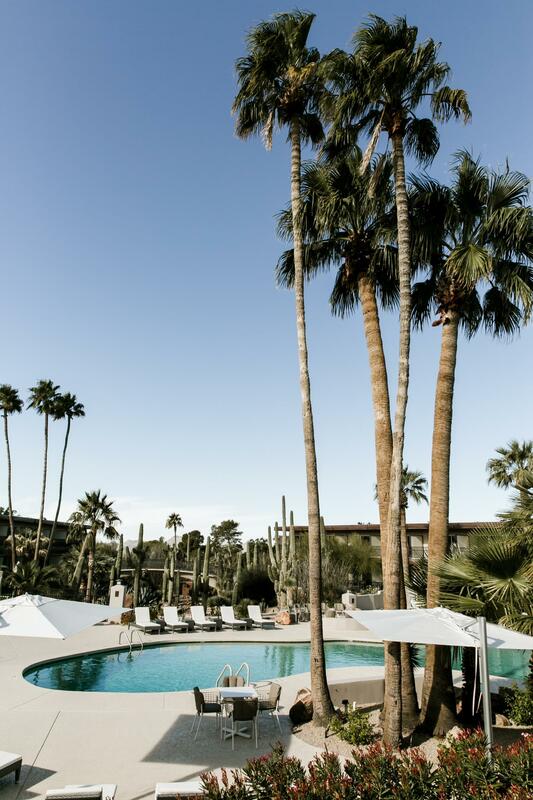 The ultimate wellness resort, CIVANA sits in the Sonoran Desert with hydrotherapy at the heart of its wellness programs and the core of its 22,000 square foot spa (that’s huge, y’all). Daily classes include yoga, spinning, sound bathing, meditation, TRX, bodyweight training and more. 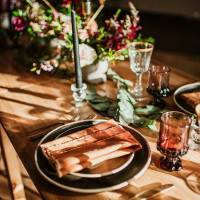 The restaurants and accommodations follow suit, with everything focused on getting guests back in touch with themselves and their unique needs. Good for groups: lots of options here for meetings and events of a corporate, social, wellness or wedding variety. 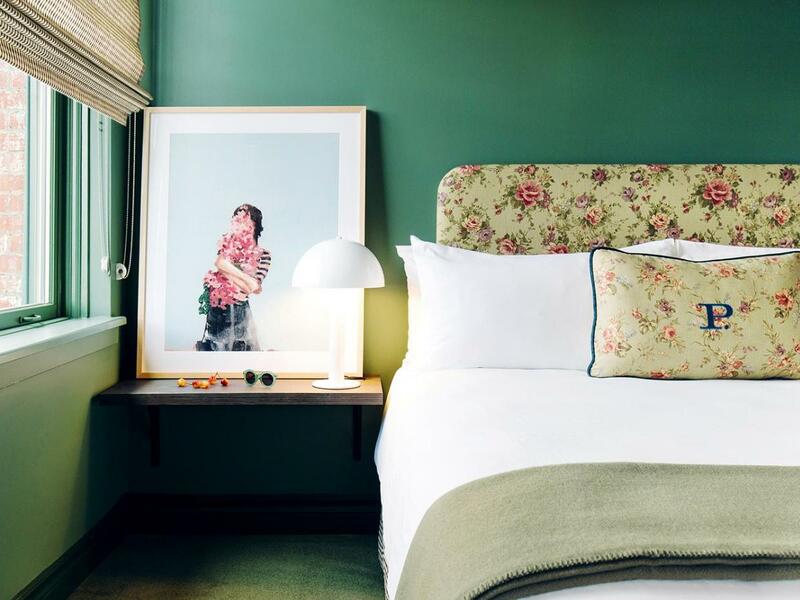 Twelve minimally styled suites with kitchens, a feeling of home and views of Melbourne’s Royal Botanic Gardens make up this small hotel in South Yarra. 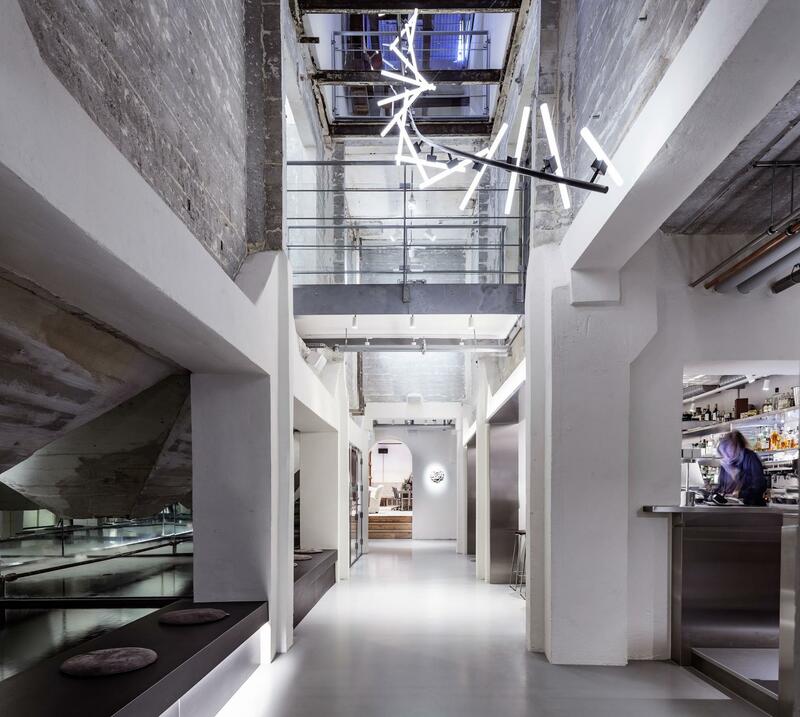 Downstairs is an excellent restaurant called Matilda that serves Australian food cooked over open fire and hot coals. Good for groups: no event spaces here, but you can call on the butler to set up in-room dining for you and your guests. Seven historic New Orleans warehouses have been renovated, combined and designed from top to bottom to create new hotel, The Eliza Jane. Set in the central business district, the ground floor is an open space that centers around a courtyard filled with plants. 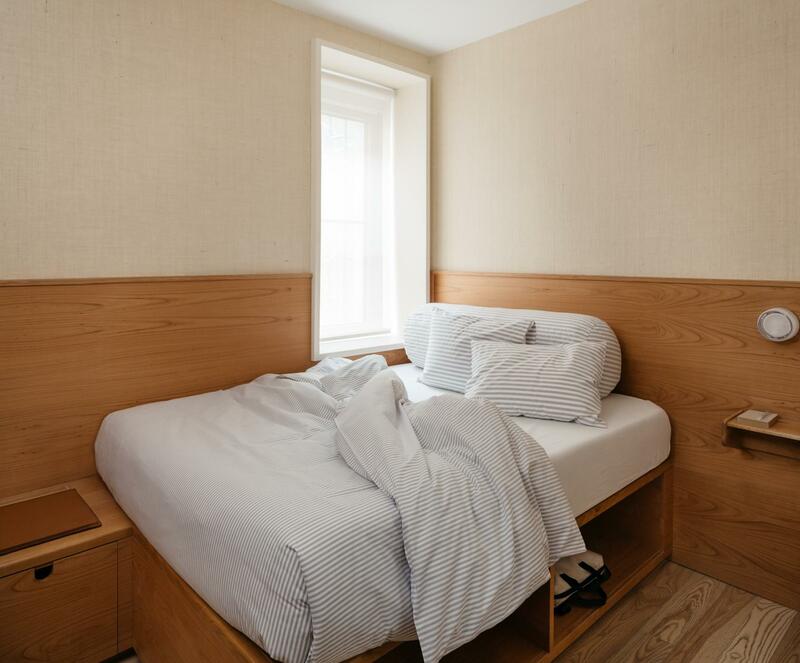 Good for groups: this hotel is awesome for group room blocks, weddings in the courtyard and dining in the on-site restaurant Couvant with friends or colleagues. 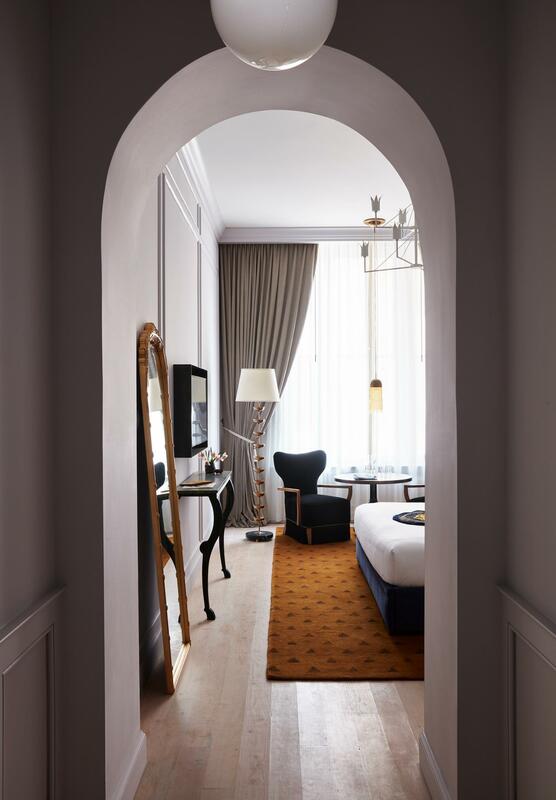 Following a four-year renovation of this century-old grand hotel on the Left Bank, Hotel Lutetia has reopened and maintains its elegant style with a fresher look. The brasserie remains a cornerstone of the hotel’s dining experience while additional restaurants and bar spaces offer beautiful settings with well-rounded menus. Good for groups: with the size and grandeur of this Parisian hotel, it should come as no surprise that there are various ballrooms, restaurants and spaces to host something extravagant. 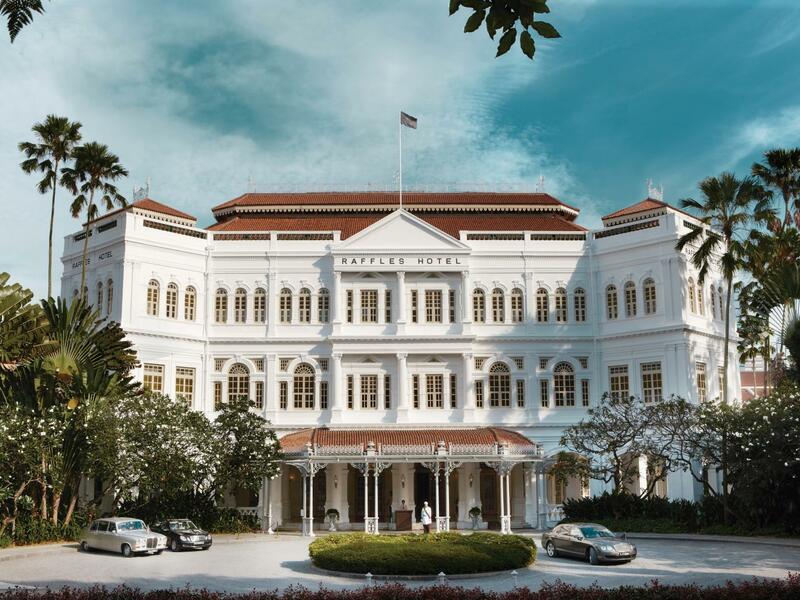 Raffles Hotel is taking bookings starting in August, when it’ll reopen following a two-year restoration of the palatial 130 year old hotel. The property boasts five restaurants, 115 sophisticated suites, a brand new spa, a grand ballroom, and multiple event spaces. Good for groups: the grand ballroom will accommodate 300+ guests for weddings and events in a beautiful old theater space. 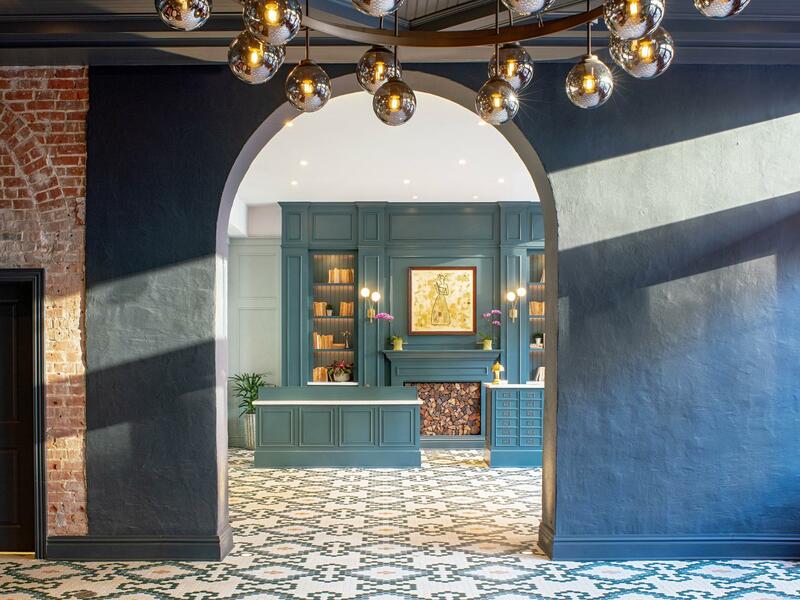 This new South End hotel pays homage to Boston’s rich history as a revolutionary city. 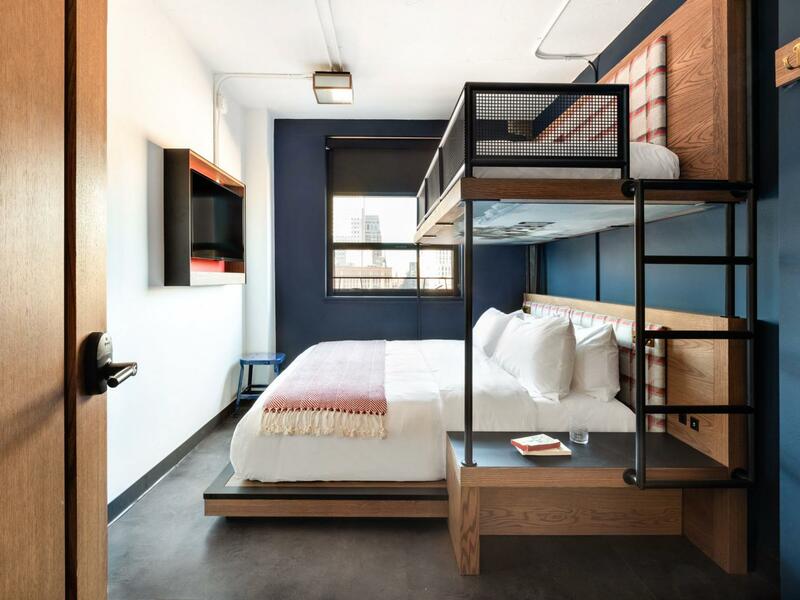 The hotel is set inside a former YWCA and has 163 dorm-like rooms and a playful, smart millennial vibe. Good for groups: there’s a co-working space on the garden level that can be used for small meetings or meet-ups, or can be rented out for private events with a casual atmosphere like a product launch, pop-up shop, workshop, birthday party, surprise party, or bridal/baby shower. 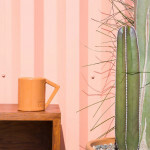 Southwestern in all the right ways, the rooms and gathering spaces at El Rey Court feel deeply rooted by their place. 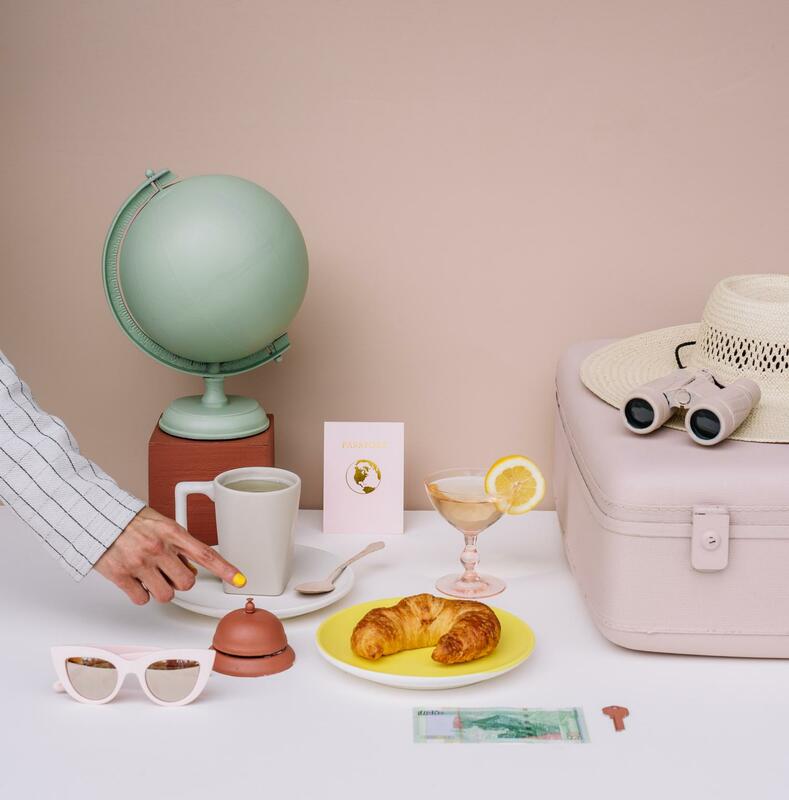 The roadside motel dates back to 1936 and was recently renovated and relaunched with a swim club that’ll host events and a mezcal bar called La Reina. Good for groups: weddings on the outdoor event lawn can suit up to 150 guests while smaller crews can set up in the private meeting room with a fireplace. 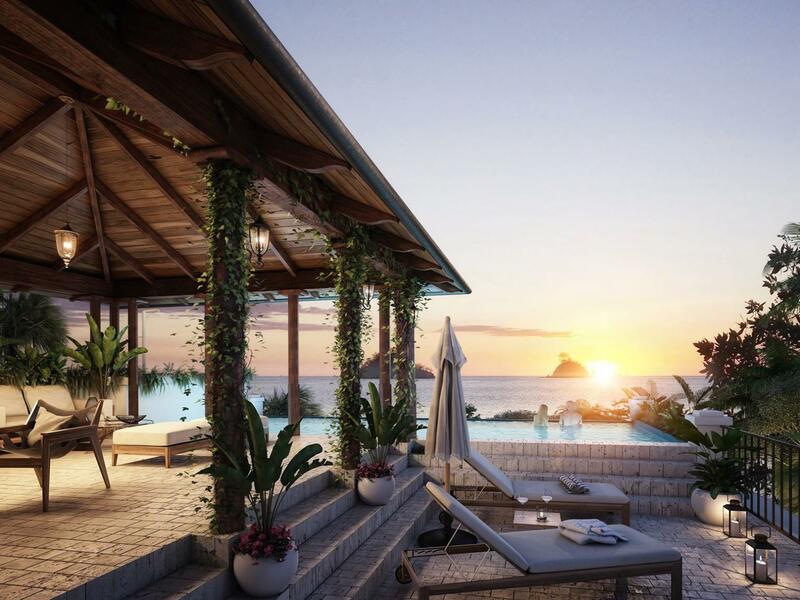 Set to open in December of 2019, this new Ritz-Carlton property sits along the rugged coastline of Puerto Los Cabos, Mexico. With panoramic views of the Sea of Cortez, the 115 suite and villa only property is all about marrying the desert and ocean with that signature touch of Ritz luxury. Good for groups: There are multiple beach-front villa options with several bedrooms and bathrooms perfect families or friendcations. 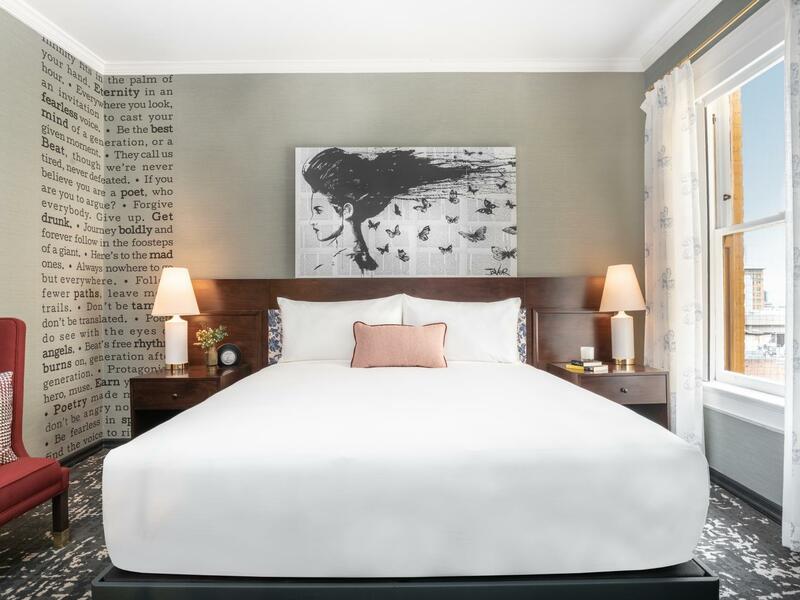 Reopened in July 2018, The Mayfair underwent a top-to-bottom renovation including a newly curated art collection found throughout the hotel. As part of the property’s makeover, the hotel features new dining and drinking options complete with onsite restaurant, Eve. The hotel is also filled with nooks, crannies and secret rooms including a custom podcast studio and communal writer’s room. 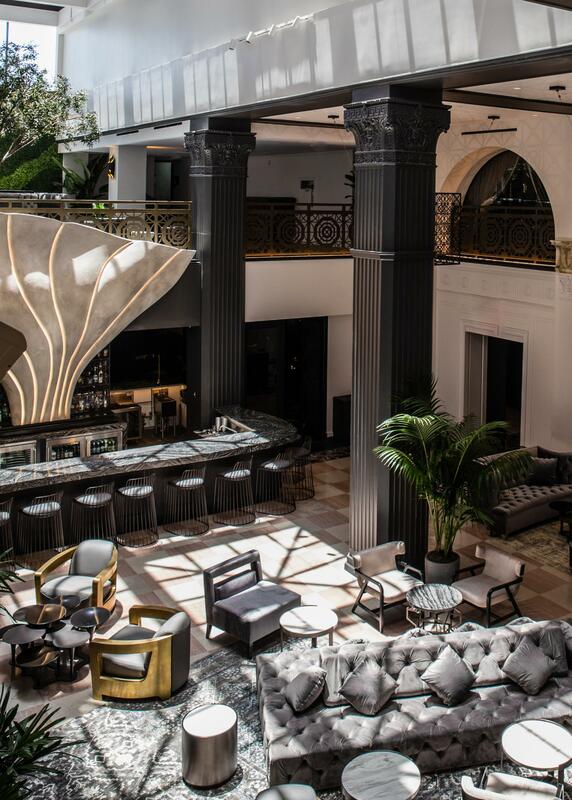 Good for groups: Inspired by the spirited past of Hollywood, every aspect of the hotel is designed for groups from the moody lounge corners perfect for a weekend Martini with friends to the glamorous rooms prime for downtown sleepovers. 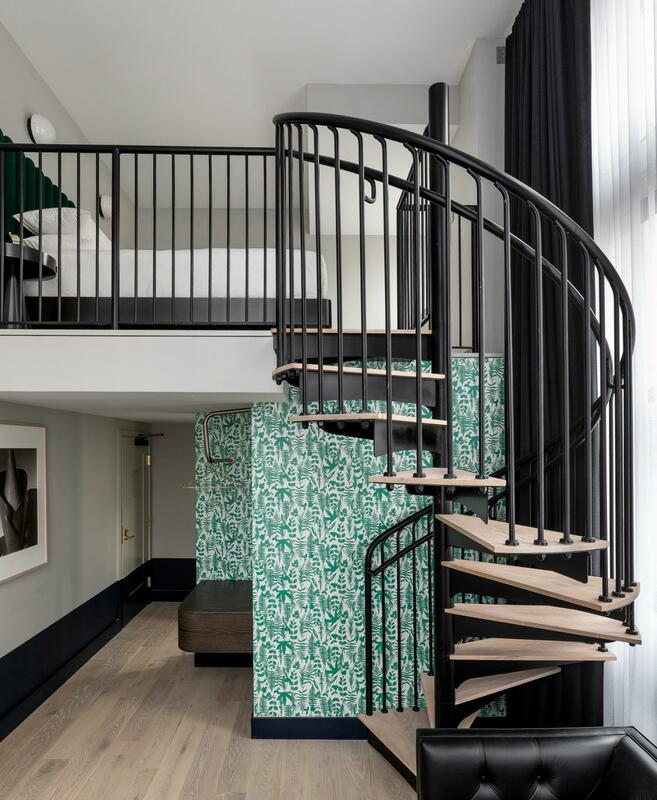 Amsterdam’s new Soho House property offers members their choice of 79 luxurious suites in a historic building right along the banks of the Singel Canal. 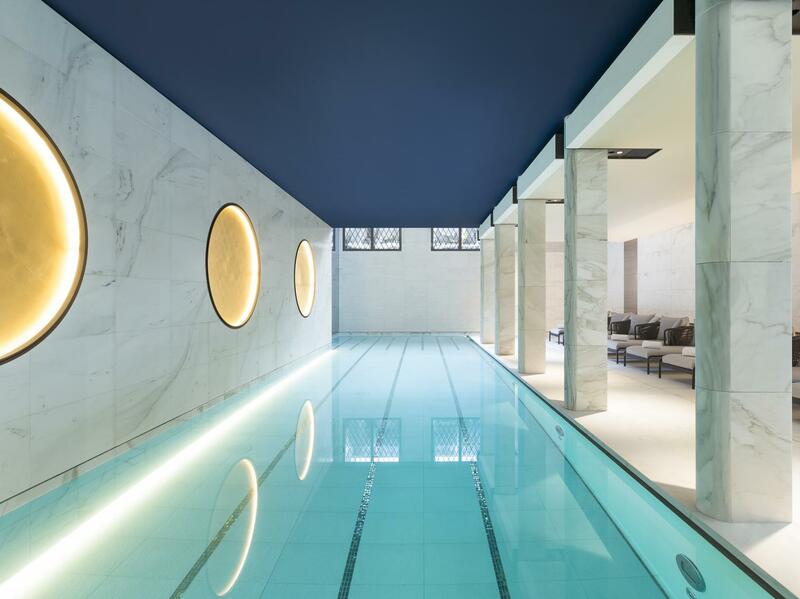 There’s a fabulous spa, a gorgeous rooftop pool deck with cabanas and a lap pool, a fitness center, and a Cecconi’s restaurant on the ground floor. Good for groups: the Bunge Room is a clubhouse that takes up an entire floor of the hotel and can be used in segments depending on your party crew’s size. 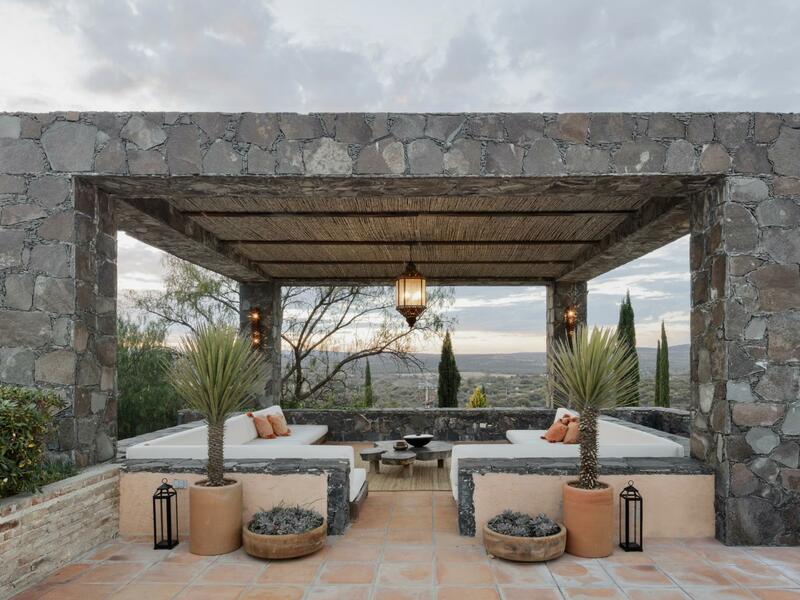 Set just outside the city center of San Miguel de Allende, Casa Adela is designed in a way that makes the natural desert surrounds feel like the star of the show. 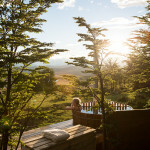 That’s not to say the spaces and suites aren’t beautiful (they 100% are) but rather to suggest that the countryside setting with its orchards, gardens and hot spring fed pool are where you’ll want to spend quite a lot of your time. Good for groups: the restaurant, rooftop terrace and lounge are prime real estate for weddings and private events. 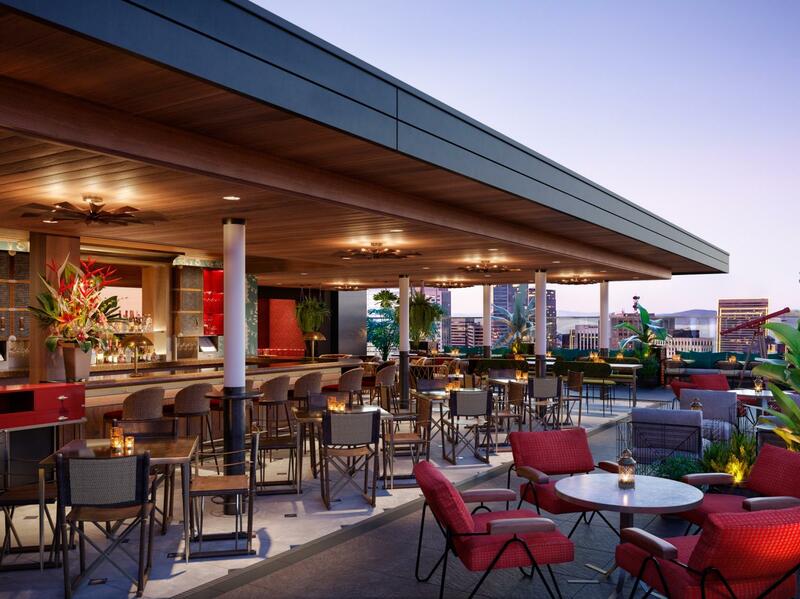 The Guild’s downtown San Diego opening is slated for later this year, with a dash of modern nostalgia incorporated into the design of its rest-worthy rooms, beautiful bar, kitchen and courtyard, and bright ballroom space. 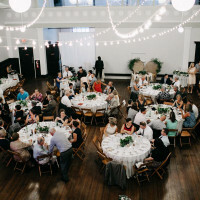 Good for groups: share a seated meal in the courtyard or the ballroom, all depending on the size of your crew and the level of privacy you’re looking for. It’s fitting that this grand house and garden property in Palma’s Old Quarter is set to open March 22 with a big Great Gatsby themed party. Decadent romanticism sets the inspiration for the 24 suites at Can Bordoy, while an indulgent spa and garden-driven restaurant round out the overall guest experience. Good for groups: no formal ballrooms or event spaces here, but gathering in the restaurant, Botanic, is sure to be a treat. 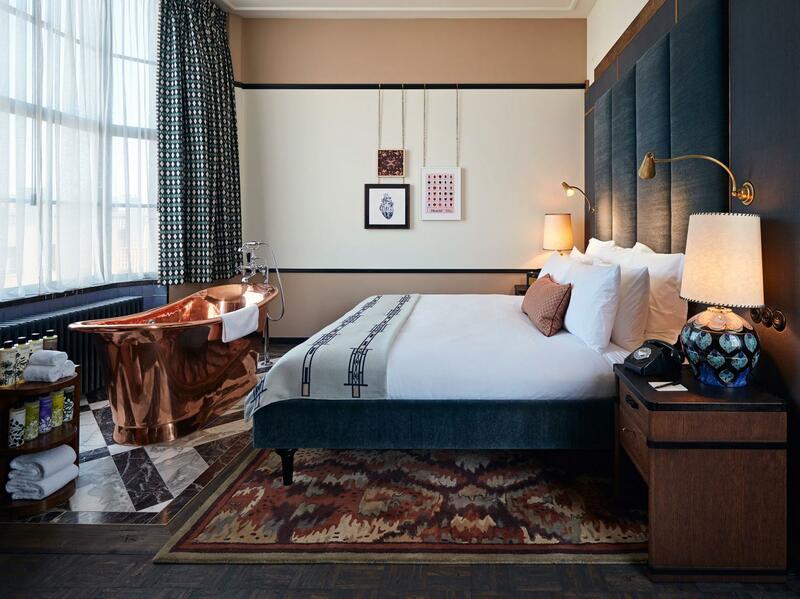 The Ace Hotel’s newest spot on the Bowery just opened earlier in March. 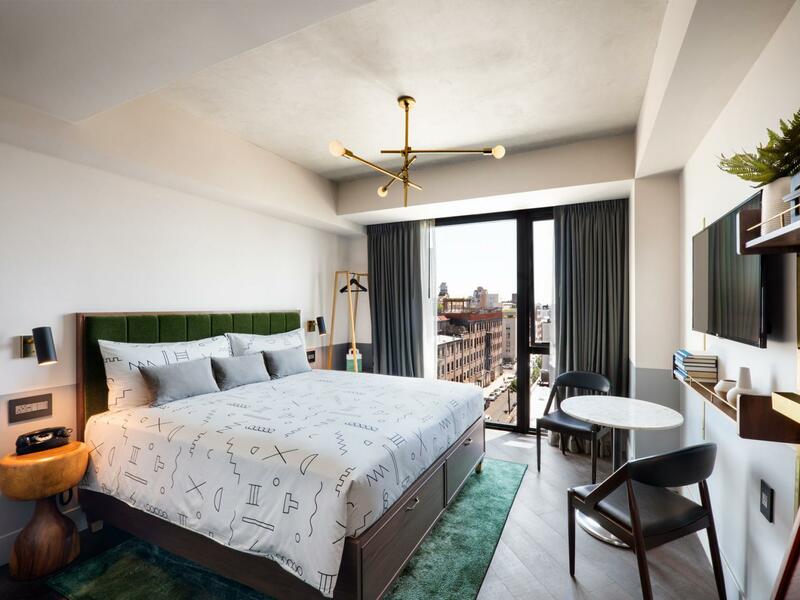 Located next door to the New Museum and in the heart of the Lower East Side, the 200-room hotel known as Sister City is within walking distance to countless shops, bars, restaurants and more. Good for groups: there will be a ground floor restaurant with a patio outside and a rooftop bar, both of which have potential to be great for gatherings. 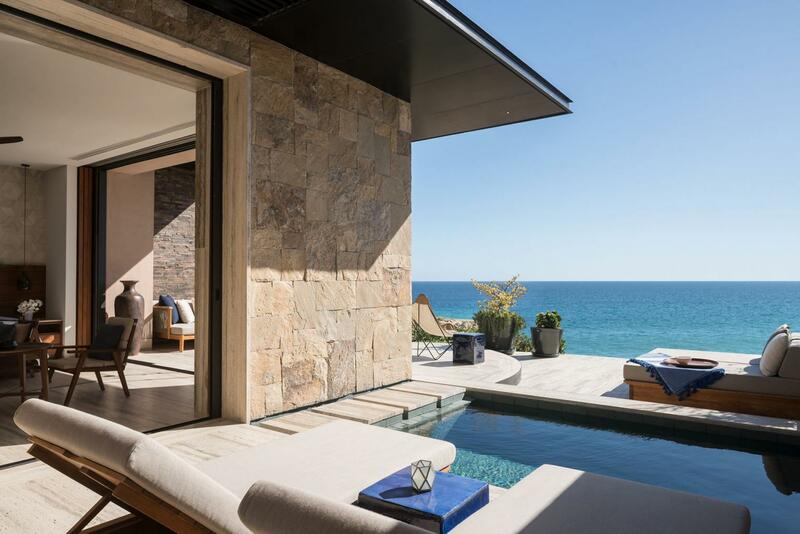 Everything feels bigger, grander and more luxurious at this Viceroy resort in Los Cabos. 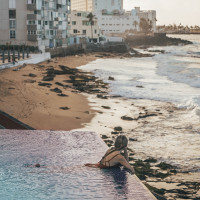 There are seemingly endless pools connected by a series of walkways, there’s a super-sized thatched dome floating on water, there’s a rooftop deck that looks right out to the Sea of Cortez, and there are huge suites that open onto the interlinked pools. 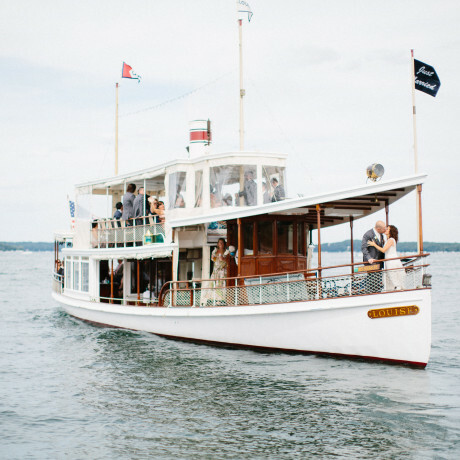 Good for groups: keeping on trend with the grand scale, large groups are welcome to celebrate weddings, anniversaries, birthdays, corporate getaways, milestones, and more. Smaller groups are always welcome too. 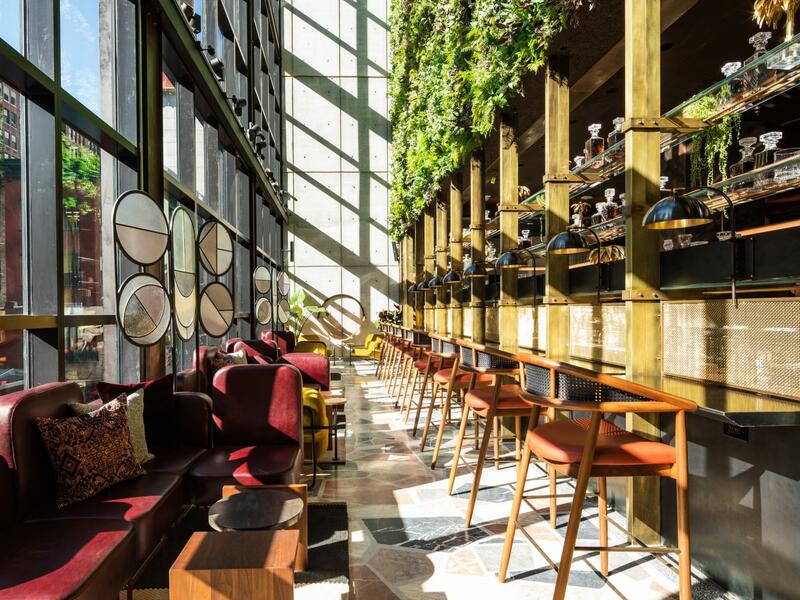 Located on the top four levels of the Park MGM, NoMad LV is a kind of jewel box of the Strip with elegant suites, a casino that’s reminiscent of old European glamour and a beautiful bar and restaurant with award-winning chef Daniel Humm at the helm (Eleven Madison Park). 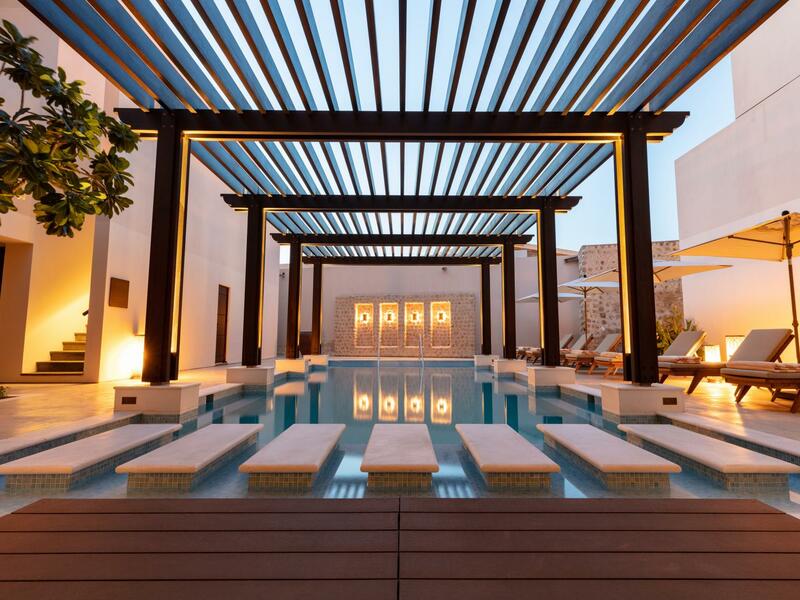 Plus, there’s a new Moroccan-inspired pool area set to open in April with parties for guests and locals on Fridays, Saturdays and Sundays (starting in April 2019). 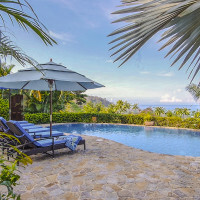 Good for groups: with a wine cellar, a cocktail bar and lounge, a formal parlor filled with antique books, a stunning restaurant, a bar, and a garden-like pool deck, gathering at this hotel is simply a matter of narrowing down the options. 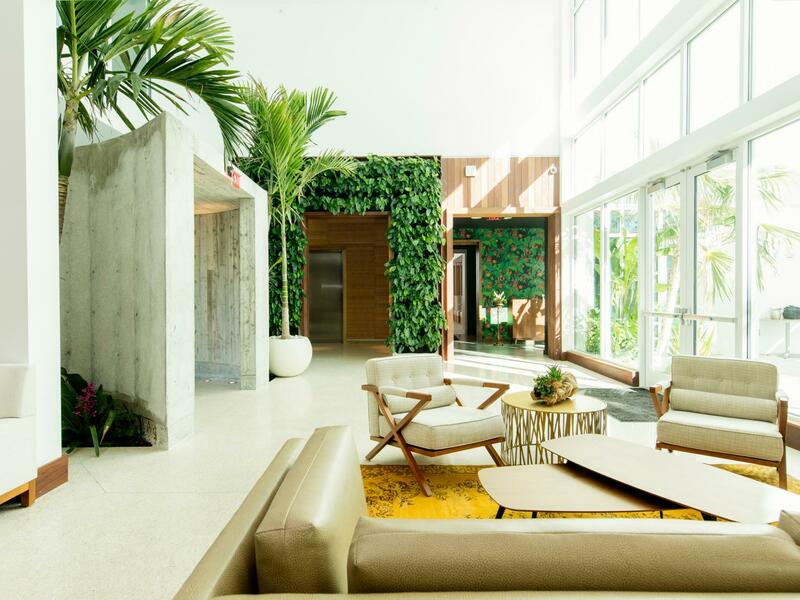 Gorgeous guest rooms and a rooftop dripping with plants set this tropical mansion up for hotel success in Little Havana. The suites are already open, with the rooftop to follow suit in the springtime. Good for groups: the view from the rooftop would be an awesome backdrop for a cocktail party! Everything is bigger in Shanghai, and this hotel is just one example. The 145 suites are spacious and modern, offering cityscape and water views. The ten stories of shared-use space includes five meeting rooms and a couple of forums. Hop up to the 27th floor and you’ll find a Cantonese restaurant with five private dining rooms, three lounge bars and two rooftop bars. 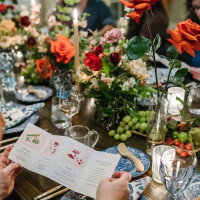 Good for groups: the possibilities for dining and drinking with friends, family or business associates are seemingly endless here, with various ways to host an exclusive event. 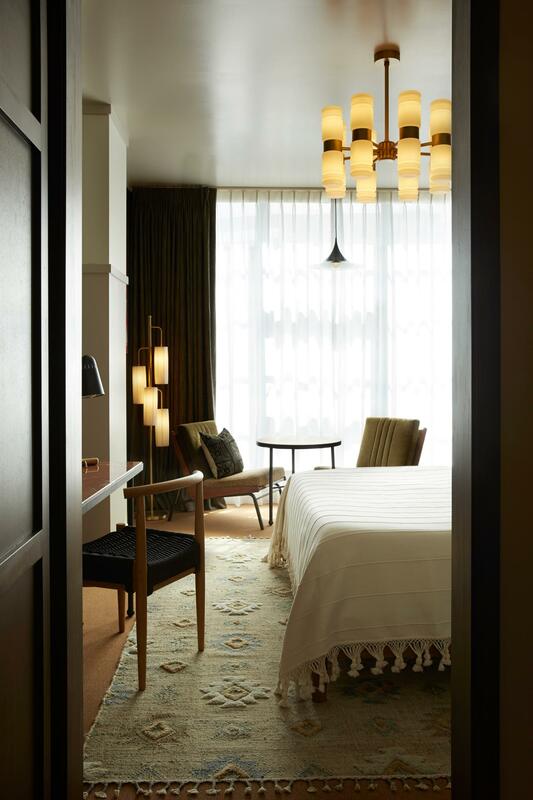 Newcomer to Union Square, SF’s 96-room Hotel Emblem is stylized to pay tribute to the Beat Generation. Think eclectic rooms, a writer’s alcove in the lobby, weekly poetry slams and so on. Great for groups: there’s a meeting room that’s great as a group work space, there’s a den that lends well to cocktail parties or book tours, and there’s a lounge space that makes an easy place for a casual hang or break-out session. A Curio Collection property by Hilton, Baker’s Cay in Key Largo sits on lush tropical land in what feels like paradise. There are 200 guest rooms on the grounds and the ballroom space is absolutely beautiful with tall ceilings, tons of windows and modern brass chandeliers. Good for groups: we’re thinking all things wedding - welcome party, rehearsal dinner, ceremony, reception, brunch, the whole lot! The sprawling new JW Marriott Resort & Spa in Cancun sits just off the main hotel zone along a nice stretch of white sandy beach. 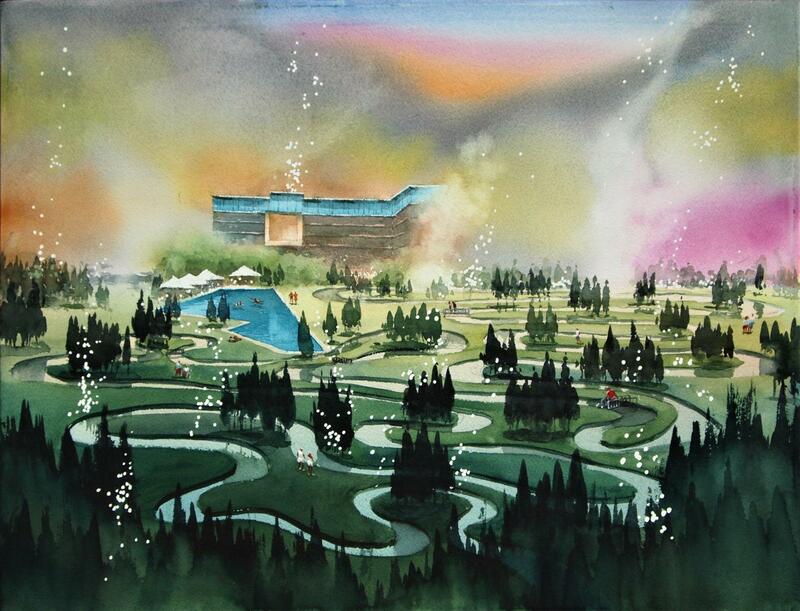 With 447 rooms, 8 event venues, 10 dining options, a Mayan spa, and a whole lot of swimming pools, this place is epic. Good for groups: with the convention center nearby, this makes an easy place to host additional convention events and meetings. Weddings, private events, birthdays, group getaways, bachelor/ette parties and more. 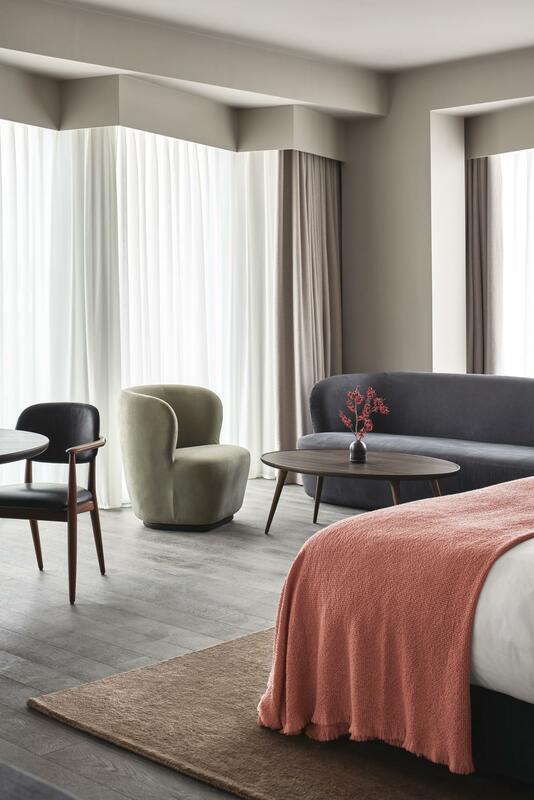 Oslo’s newest hotel is set to open in mid-March and includes 122 gorgeous guest rooms, an all-day brasserie and cafe, a craft cocktail bar, a jazz club, a garden that’s open throughout the year, a Finnish sauna, and a plunge pool. There’s even a beautiful little library. Good for groups: cocktails and small bites in the courtyard, a private jazz show or performance in the nightclub, or a shared dining experience with friends in one of the restaurants. 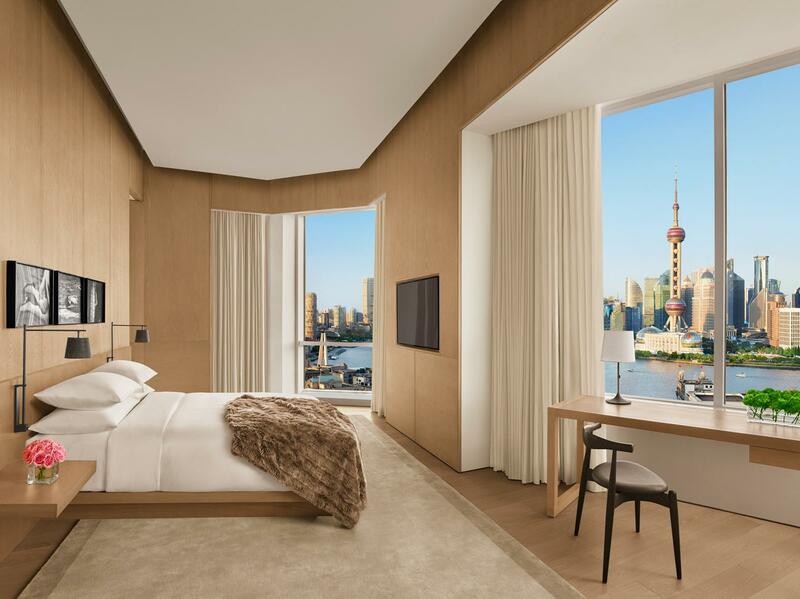 This modern urban sanctuary is located just blocks from Beijing’s Palace Museum and its rooms offer sweeping up-close views of the Forbidden City. Good for groups: private dining spaces, meeting rooms and a rooftop terrace are all available for private events that lend well to business oriented agendas. 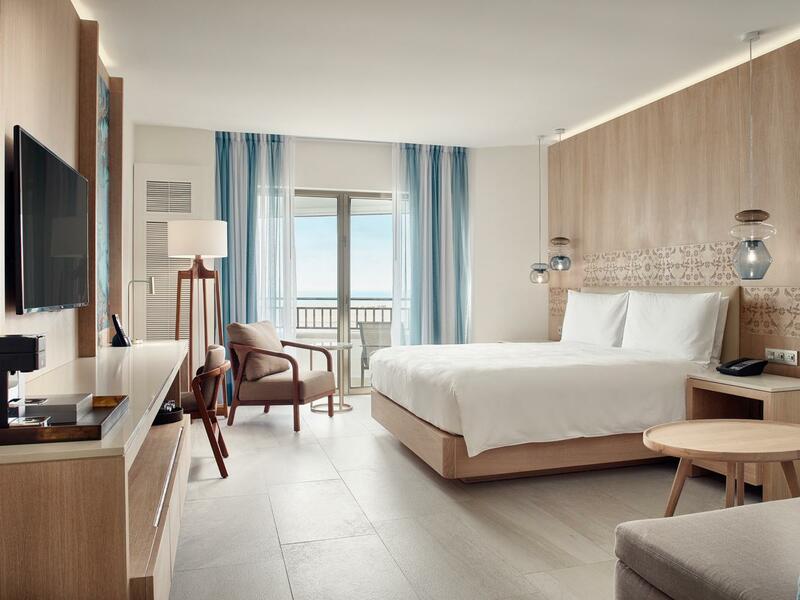 The Jersey Shore’s first five-star luxury resort is opening this summer and brings a combination of residences and 54 boutique hotel suites. Good for guests: The main social hub at Asbury Ocean Club will be the expansive pool deck with its poolside bar and grill, pergola, glass garden pavilion, and outdoor fireplace. 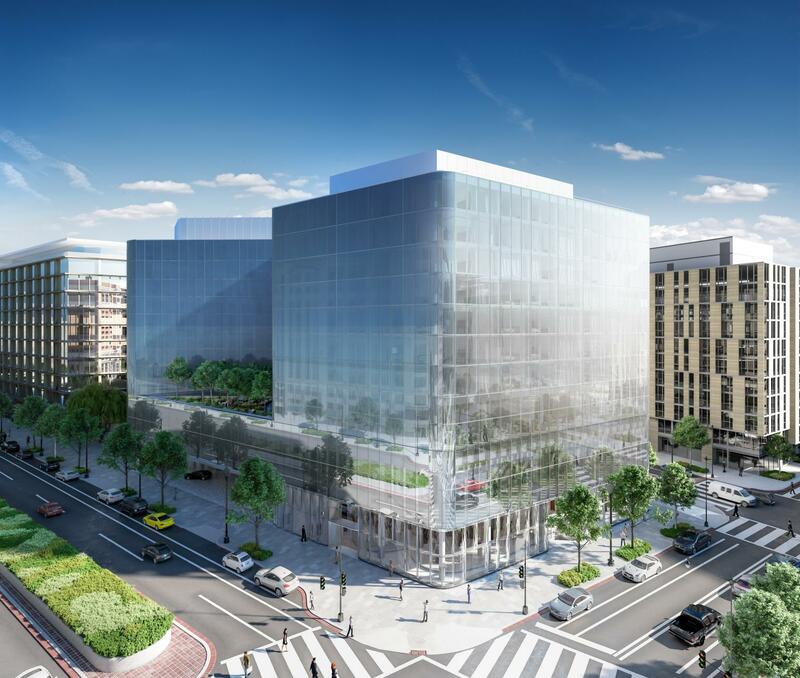 Scheduled to open in the first quarter of 2019, Conrad Hotel in DC promises “contemporary luxury, inventive architecture, flawless service and inspired experiences,” in the heart of the city. 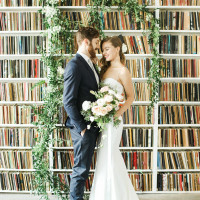 Conferences and weddings will be part of the scene, with elegant ballrooms and a lush rooftop venue. Good for groups: we’re thinking multi-day events at this gorgeous spot, including cocktail parties, meetings, dinners, presentations and more. 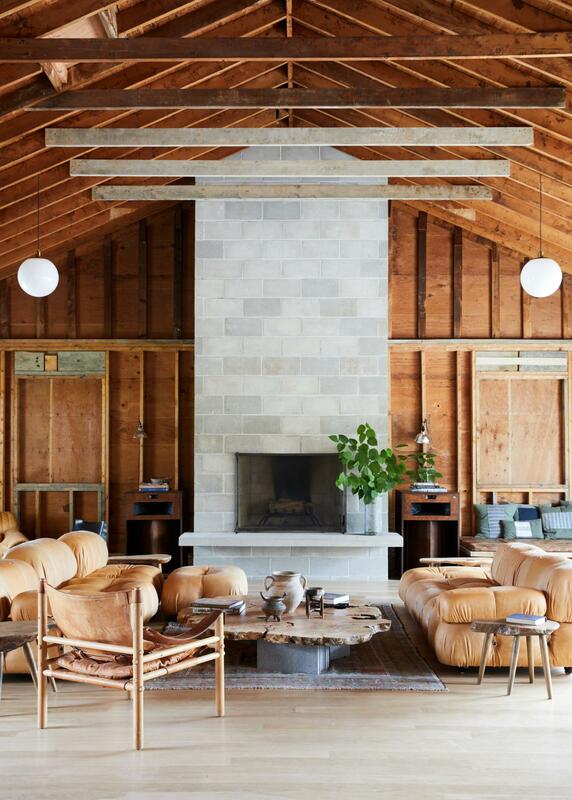 When all the charm of an idyllic French countryside estate collides with modern Parisian aesthetic, you end up with Le Barn. 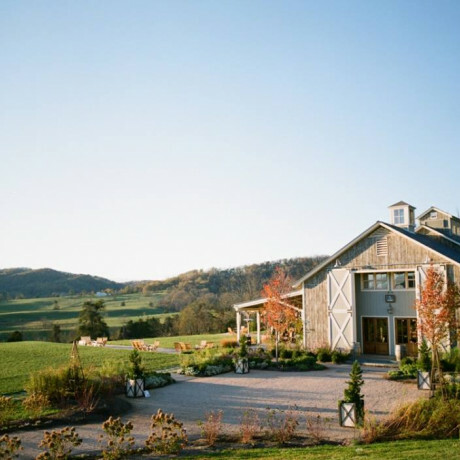 Spread across a working farm, the casual approach to luxury here is unlike many resorts we’ve seen. Guests are offered a roster of activities during each day of their stay but may be just as happy getting lost on the grounds and hopping into the forest-facing Nordic baths at their leisure. 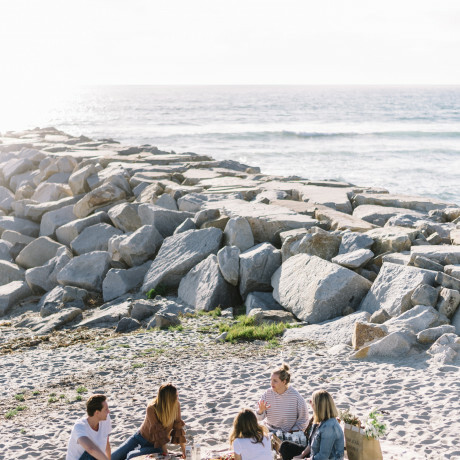 Good for groups: nature and wellness retreats, coworking and hosting meetings in a place that sparks imagination, seminars for as many as 350 people, photoshoots and workshops, product launches. Set in the lush tropical jungles east of Bali, this collection of 27 Sumbanese-style villas offer private balconies and plunge pools for guests as well as a couple of restaurants that highlight island cuisine. Good for groups: no big event spaces here, but if you’re planning a group getaway, look into booking a cooking class with the island chef. 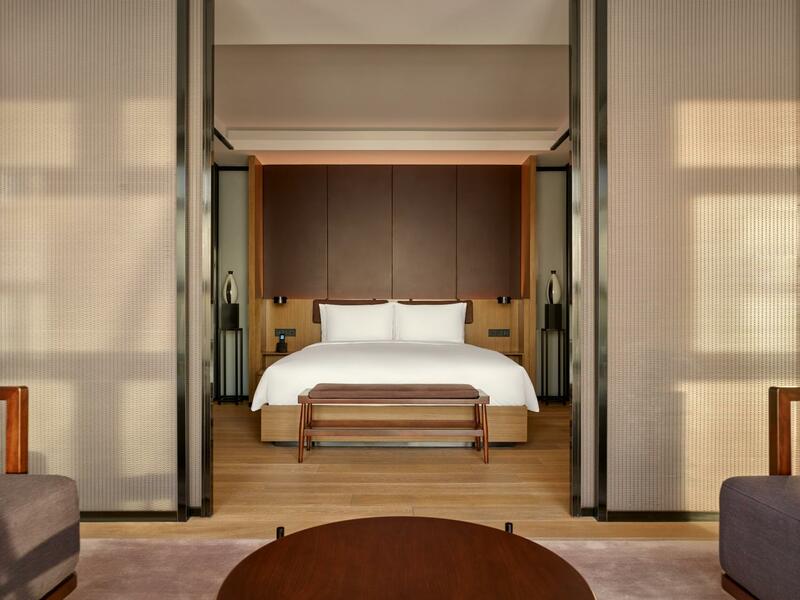 Located on the top two floors of upscale retail haven WF Central, the new Mandarin Oriental Wangfujing offers 73 spacious suites overlooking Beijing and the Forbidden City. Two restaurants and a bar open onto a garden rooftop terrace and there’s a spa inside the hotel with a large indoor lap pool and sky roof. Good for groups: formal business meeting spaces and cocktail party rooms are available, but product launches would also do well as this location is in the heart of the Wangfujing retail district. 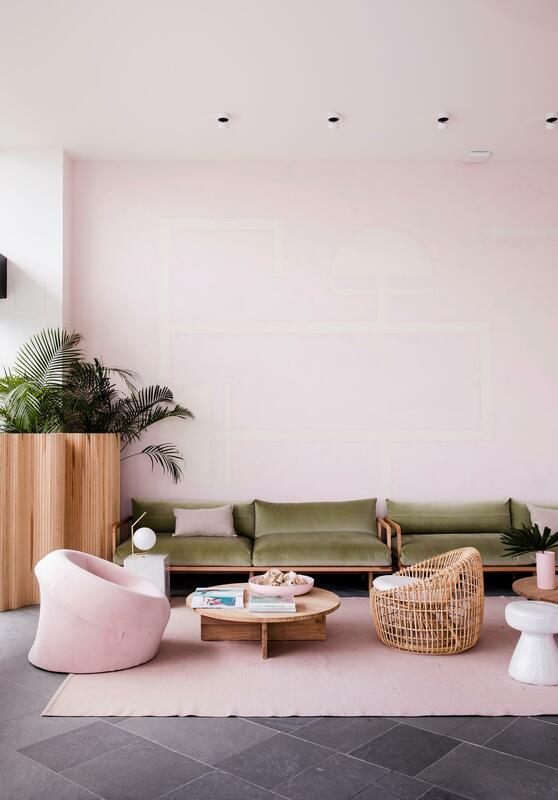 The 89 rooms at The Modern are light, bright and airy while the poolside juice bar, coffee house and restaurant follow a similar minimalist aesthetic. Good for groups: upstairs you’ll find a large glass-walled studio space that’s great for events of up to 50 guests, there’s a private dining room suitable for about 80 guests and the pool deck can accommodate up to 300 guests. So party on, Sarasota. 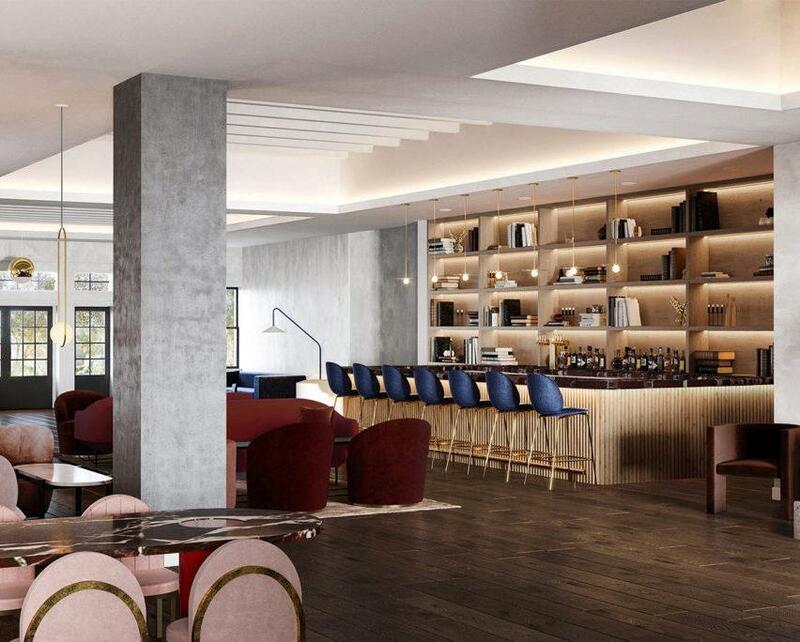 Scheduled to open summer 2019, the 244 rooms at this downtown Austin hotel are designed by celebrity interior designer Kelly Wearstler. 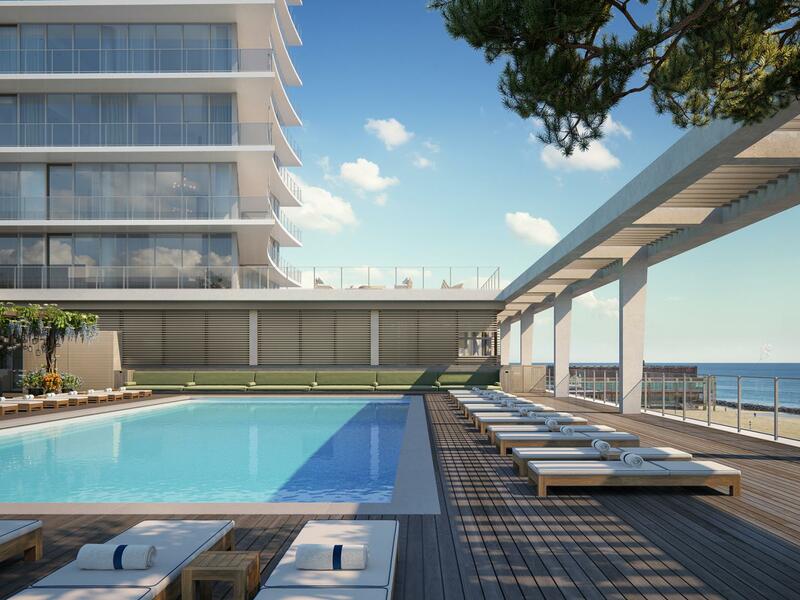 Austin Proper Hotel and Residences promises a pool deck on the fifth floor and a Mediterranean cafe and restaurant along with ballrooms, gardens and indoor-outdoor spaces that’ll be great for entertaining. Good for groups: small-batch tequilas on the rooftop overlooking Ladybird Lake sounds good to us! 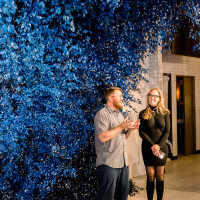 Also check it out for corporate events, meetings, off-sites, private parties, dinner parties, cocktail parties, workshops, pop-up events, product launches, album releases, book tours, and more. 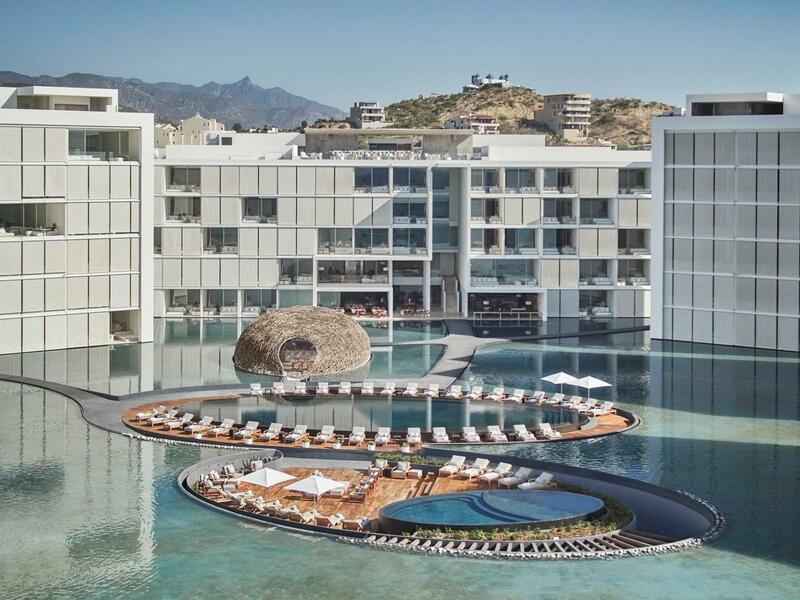 Cascading terraces pave the way to the sea at this Solaz Luxury Collection Resort in Los Cabos. 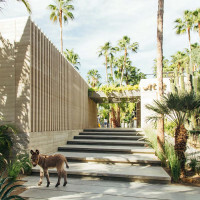 It’s part of a larger complex that includes residences, restaurants, shops, and a Baja heritage museum. Good for groups: the resort houses 147 suites and makes a great destination for conferences or large private events. If you consider yourself a traveler who appreciates getting lost and immersed in local cultures, this is exactly the kind of place you’ll want to stay during your next trip to Kyoto. 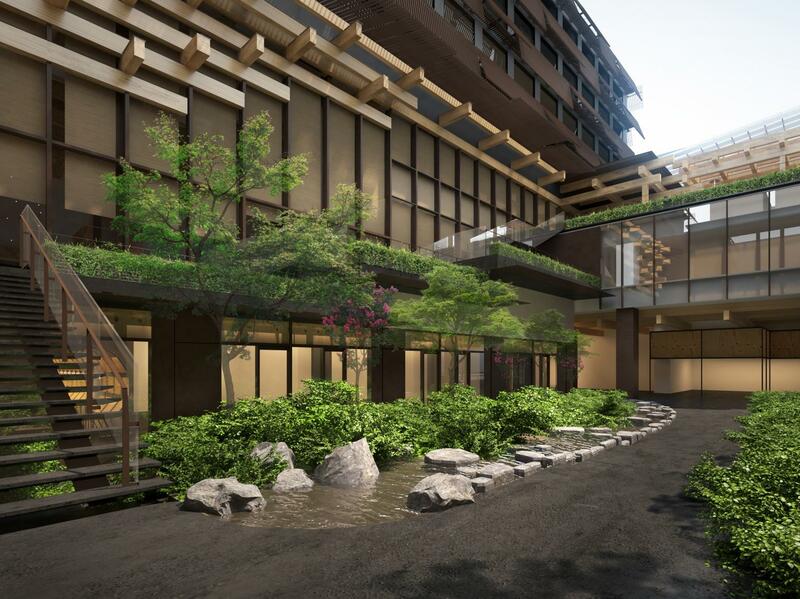 Set to open in late 2019, Japanese architect Kengo Kuma is heading up the transformation of the former telephone exchange building into a boutique hotel centered around a plant-filled courtyard. Good for groups: this project has been pretty hush-hush about its spaces, but we’re hoping the courtyard will be available for group gatherings and that there will be at least a restaurant or two for group hangs. 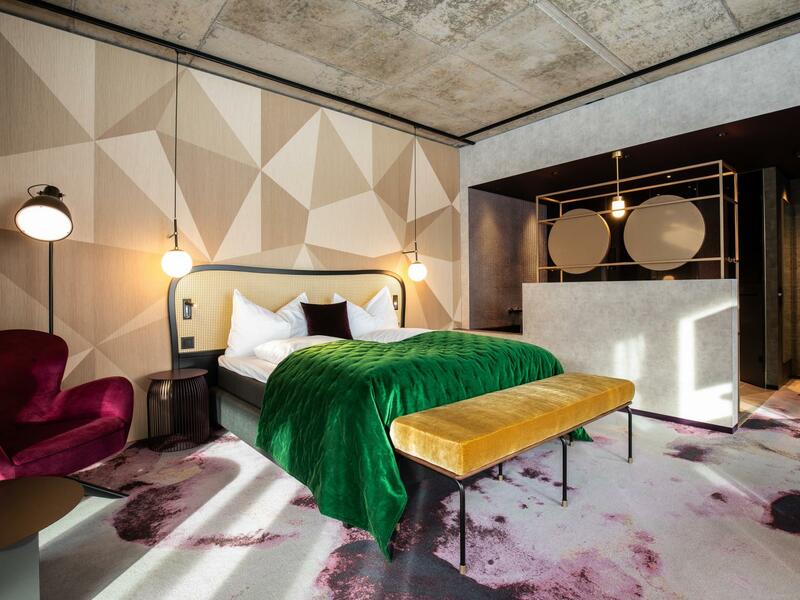 Copenhagen’s latest design hotel is Hotel Ottilia in the old Carlsberg Brewery building. The upper level Italian restaurant opens out to a terrace with shining views of the city, making a fab space for a gathering. Good for groups: ten total meeting rooms are on the property, so you’re likely find something that’ll work for any size group of up to 200 guests. 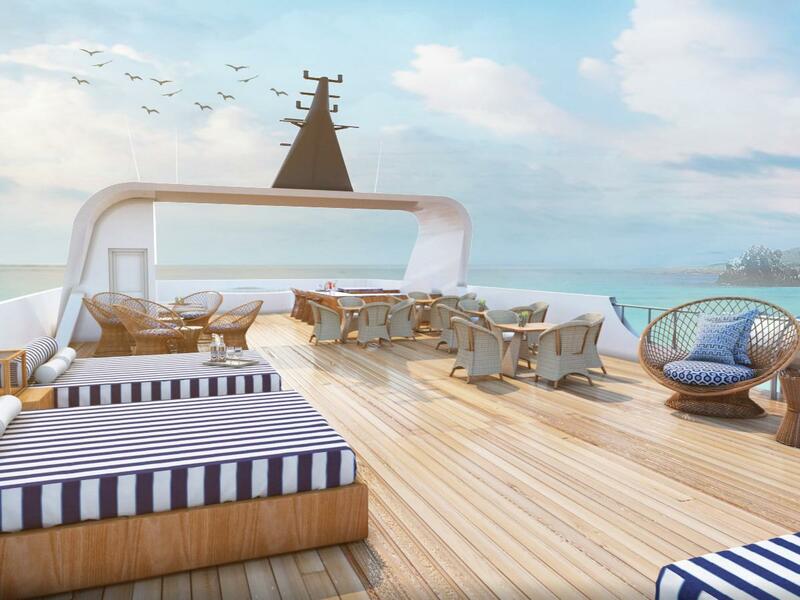 Imagine cruising through the Galapagos Islands on a small luxury yacht with only 20 passengers filling spacious suites. MV Theory is making that dream a reality with a maiden voyage scheduled for mid-March. Good for groups: how much fun would this be for a joint bachelor and bachelorette party! 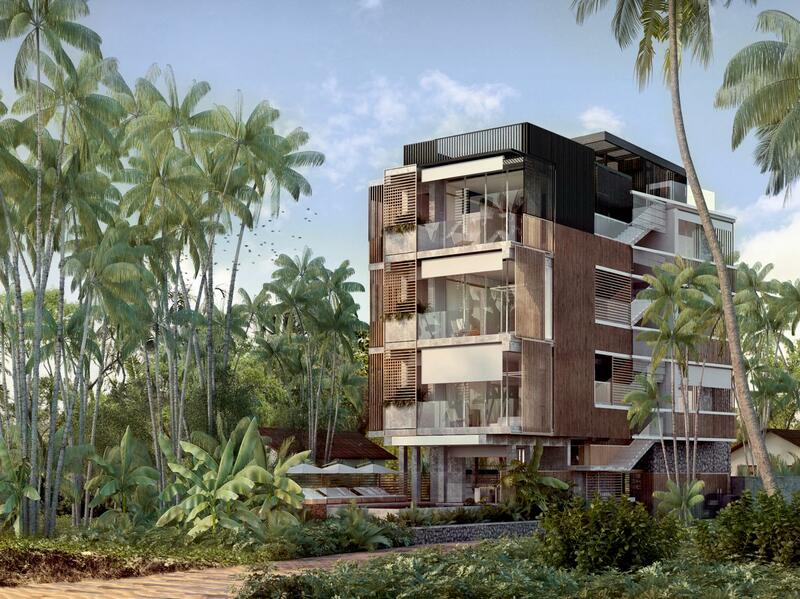 A small hotel with just six suites, Harding Boutique Hotel will be located right along Sri Lanka’s world-famous surf break. The architecture and design of the place is a lesson in the beauty of minimalism, while there’s nothing lacking in the amenities department which includes private butler service and a poolside restaurant and lounge. Good for groups: given its size, this would be a great spot to head to take over with a small traveling crew. 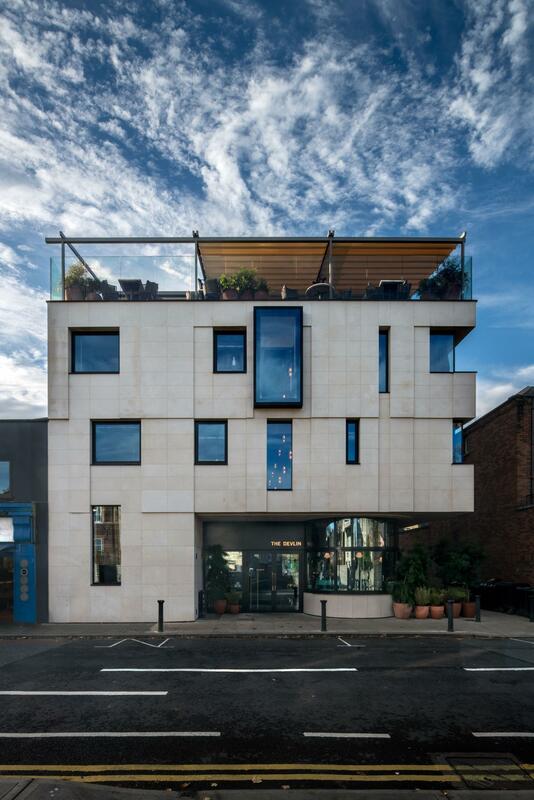 Set in the heart of Dublin, The Devlin offers 40 cozy boarding rooms, a rooftop bar and Americana-style restaurant, a hotspot cocktail bar and coffee hatch, and an underground luxury cinema. Good for groups: Layla’s is the best for events with multi-course meals and rooftop views while Americana Bar is a star for cocktails and casual gatherings like birthdays and meet-ups on the ground floor. Soho House has a new hotspot almost ready to debut (spring 2019), only this time it’s a century-old warehouse. 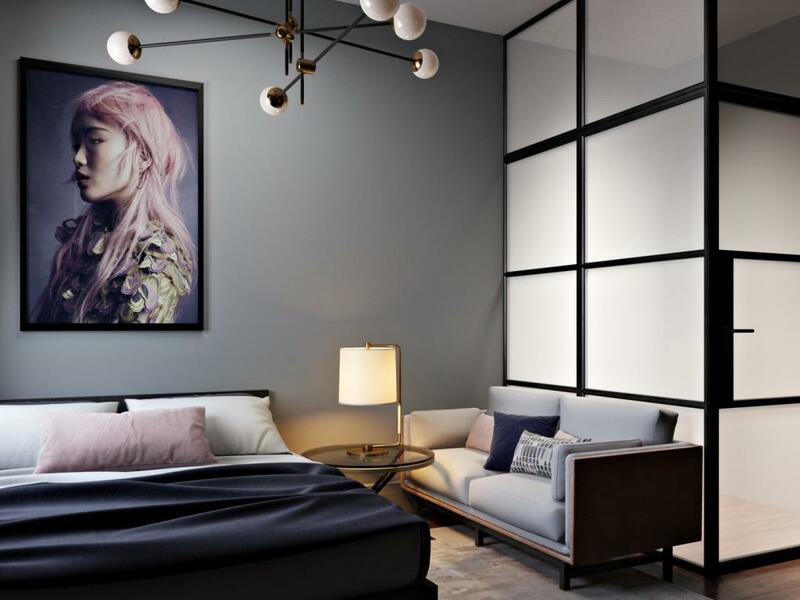 Set in LA’s Arts District, the Soho Warehouse will be home to 48 Pinterest-worthy suites, three restaurants, six bars, an events space, a rooftop pool, and an incredible art collection. Good for groups: lots of rumors about an event space, but we haven’t seen it yet. Fingers crossed it’ll be one for the books! 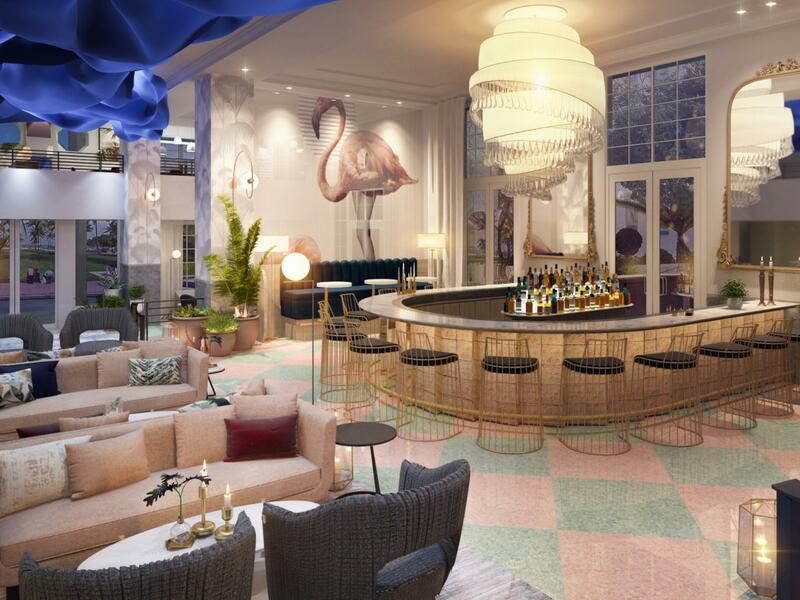 As bright, modern and playful as Miami itself, The Celino Hotel in South Beach is set to open in April. 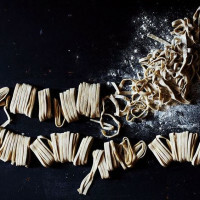 With its opening, two restaurants, Pubblica Italiana and Dalia, will also make their debut. 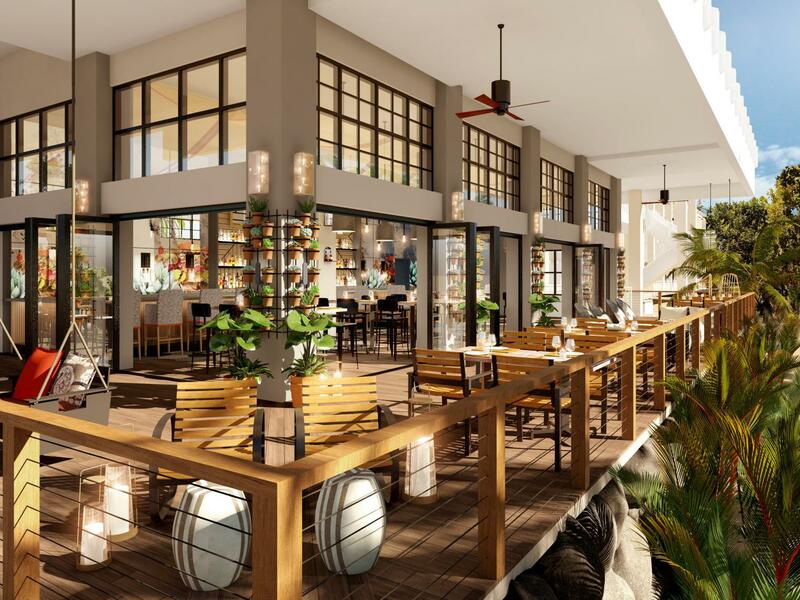 Great for groups: from what we’ve heard, this place is going to be a great party spot with beautiful restaurant spaces and a lively pool deck. Turns out, Virgin isn’t just an airline, it’s also a hotelier. The Downtown San Francisco spot offers lounge-like sleeping quarters with city views and various indoor and outdoor hangout spaces. Good for groups: group hotel bookings are made easy peasy, there’s a rooftop bar that’s great for casual drinks and nosh, a terrace lounge that’ll work well for a business chat that doesn’t feel stuffy, a posh commons club that feels like it should be members-only yet makes a great setting for seated meals and cocktail parties, and a meeting hall known as the manor that can be modified to suit groups from 16 to 126 guests. 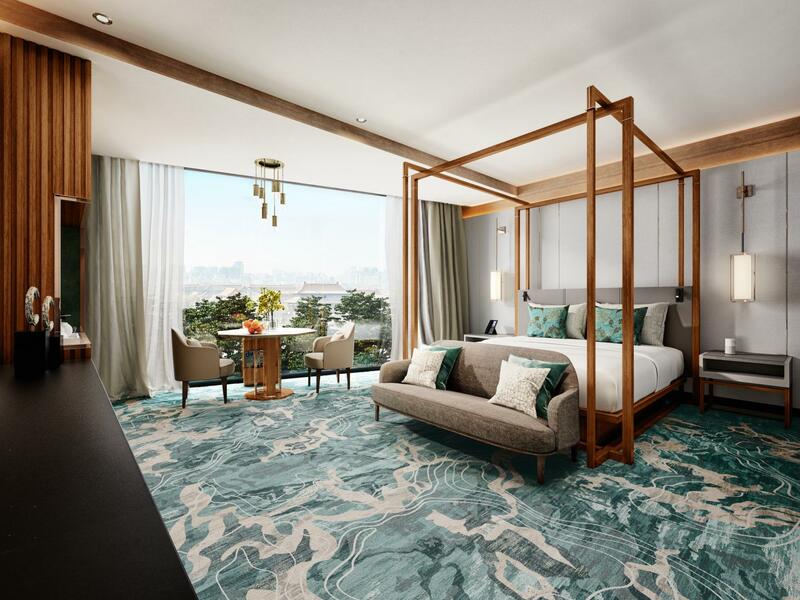 Very recently opened, Kimpton Da An Hotel in Taipei offers well designed rooms and gathering spaces that make it feel like a hidden sanctuary in the heart of the city. Good for groups: restaurant and rooftop terraces both have major potential for a shared meal or cocktail party with your group. 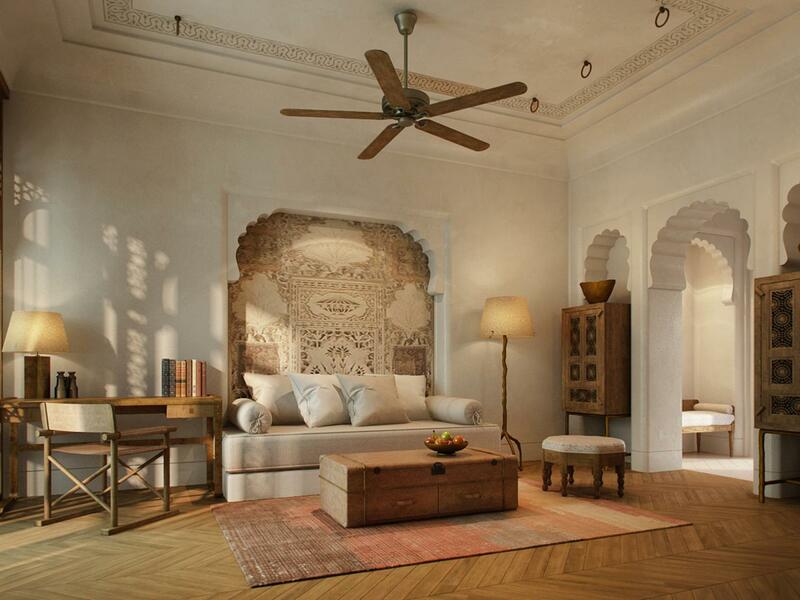 Opening later this year, the new Six Senses Fort Barwara is about three hours from Jaipur and sits directly across from an ancient temple. Housed in a 14th century fort that’s been carefully conserved, expect to find grounds that include a palace and two additional temples. 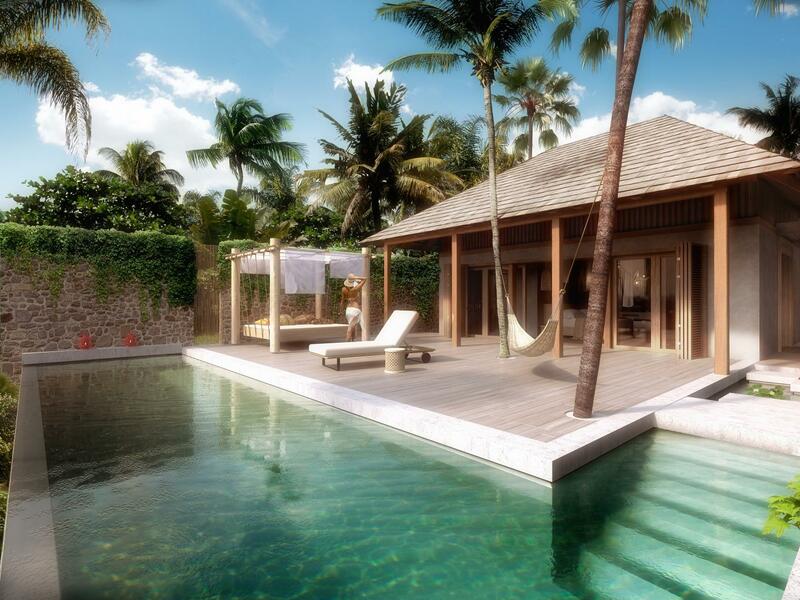 The luxury resort will include 48 suites, two restaurants, swimming pools, and an oversized Six Senses Spa. Good for groups: an extensive Ayurveda program suggests this spot will be top of the list for luxurious wellness retreats. 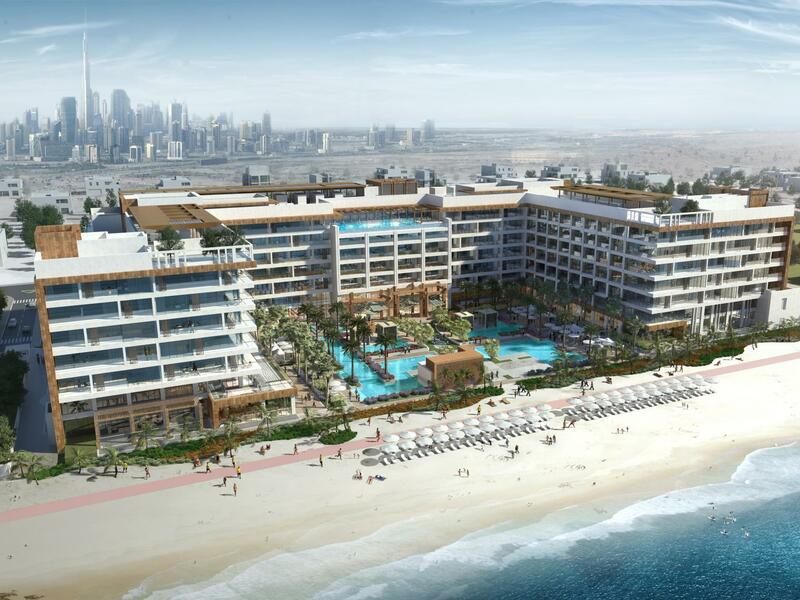 Another luxury hotel is set to open in Dubai this year, this one with beachfront access and the option of city or ocean views from your spacious suite. 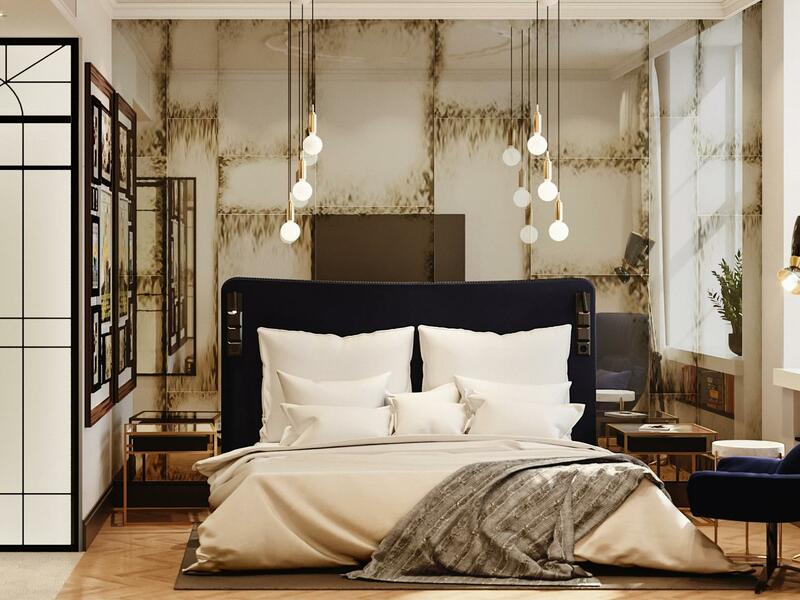 Six restaurants and lounges will be part of the Mandarin Oriental Jumeira’s setup, as will a destination spa. Good for groups: best for business meetings in a prestigious setting, hosting potential business partners for dinners, and multi-day conference events. 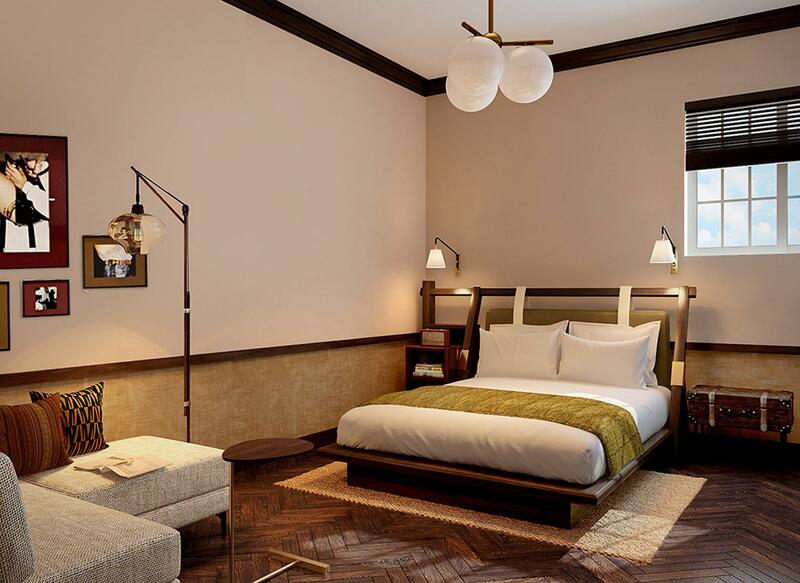 This new five-star hotel in Sharjah gives guests a glimpse of Arabian splendor with a whole lot of modern comfort added to the mix. Al Bait Sharjah has just 53 suites, an Arabic restaurant and an international one, an ice cream shop, a cafe, and a large spa. 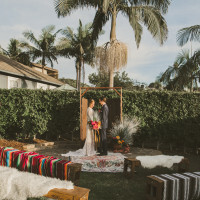 Good for groups: this resort is just the right size for a destination wedding buyout that’ll give your guests a sampling of the flawless hospitality and extravagance this place is known for. 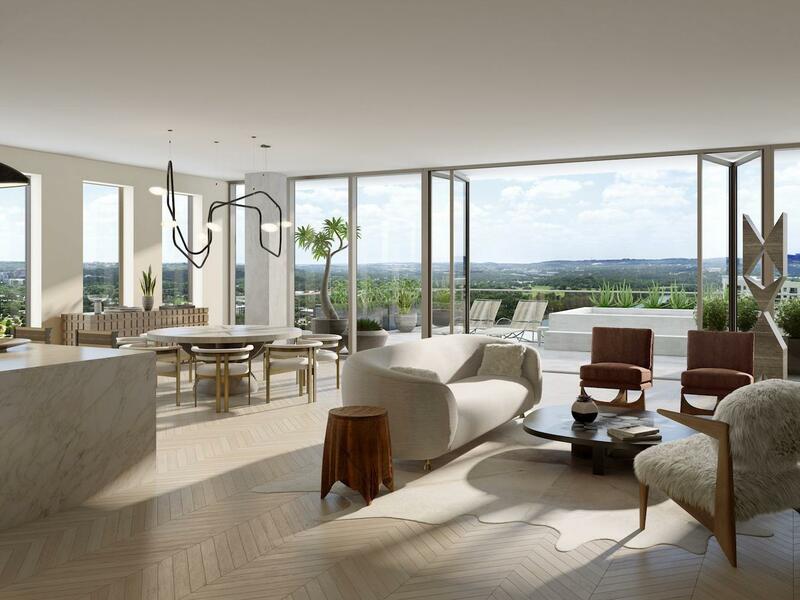 The Houghton property combines residences with a five-star luxury hotel in the heart of Johannesburg. 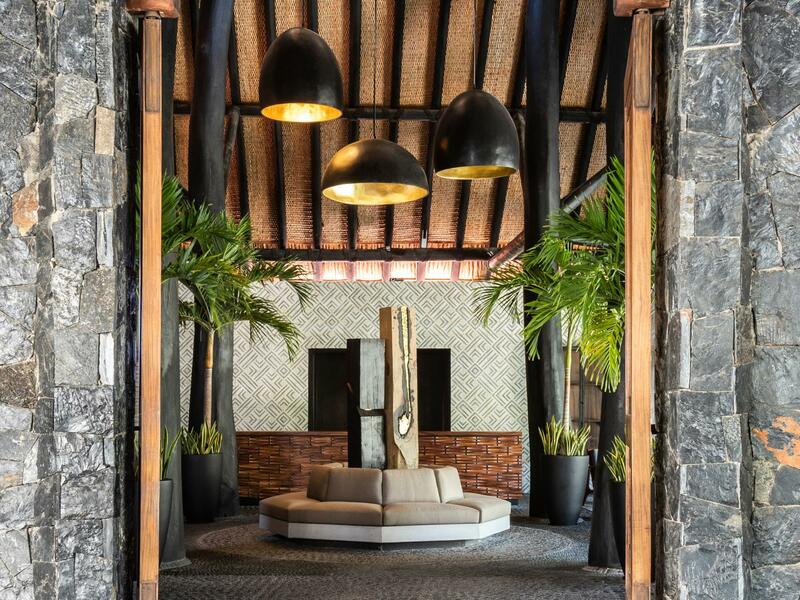 A private pool deck and heated indoor pool, signature Jack Nicklaus golf course, flagship Amani spa, wine bar and private lounge are just a few of the highlights. Good for groups: golfing getaways, multi-day business meetings, private parties, wellness retreats, conference room that can accommodate up to 500 attendees. Zuri Zanzibar sits right on the white sand beaches along the Indian Ocean, surrounded by towering palms and tropical gardens. Choose from staying in a bungalow, beach villa or suite here and dine at the beach, pool or main restaurant to experience a variety of local flavors. Good for groups: this spot would be awesome for a group getaway or retreat with friends or family. The culinary team offers what they call dining by design - a chance to set up a private event just about anywhere on the property that suits, including right along the shoreline. 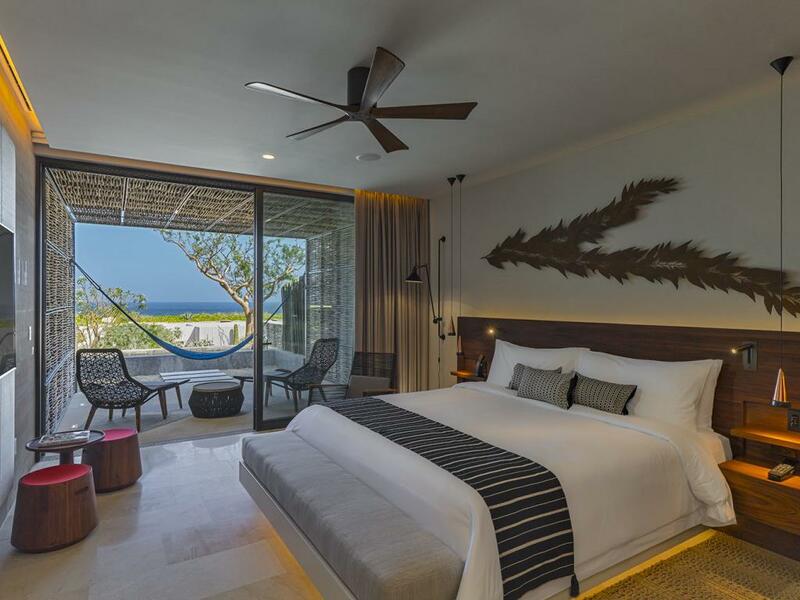 Costa Rica’s newest oceanfront resort offers a mix of suites and connecting rooms (read: great for traveling with friends) overlooking the beautiful beach. 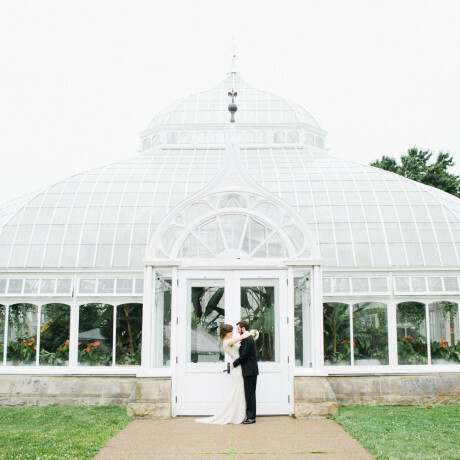 Good for groups: the conservatory, atrium, terrace, rooftop and a few smaller indoor spaces all offer event venue options for crowds large and small. 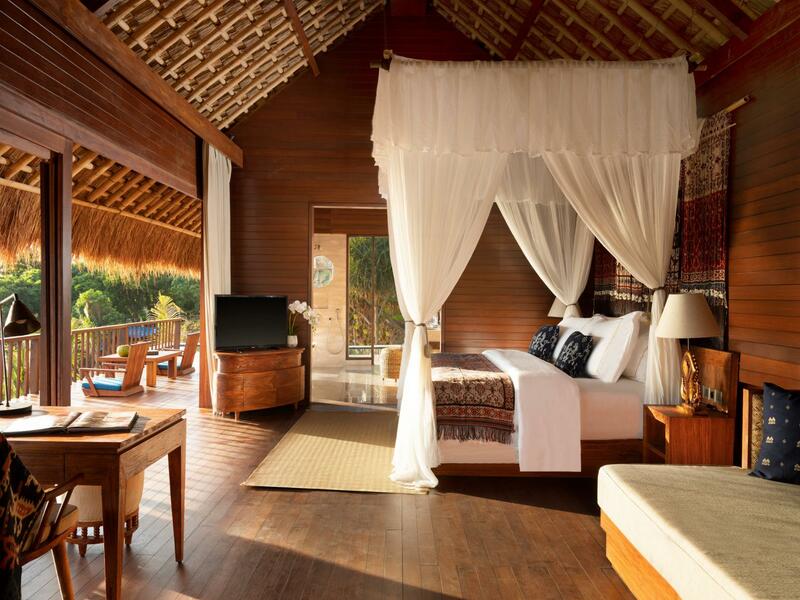 We’ve seen a whole lot of island resorts around the world, but nothing quite like this. Set on an island exclusive to all but 18 guests at a time, Islas Secas offers access to a series of 14 islands and completely secluded barefoot luxury. 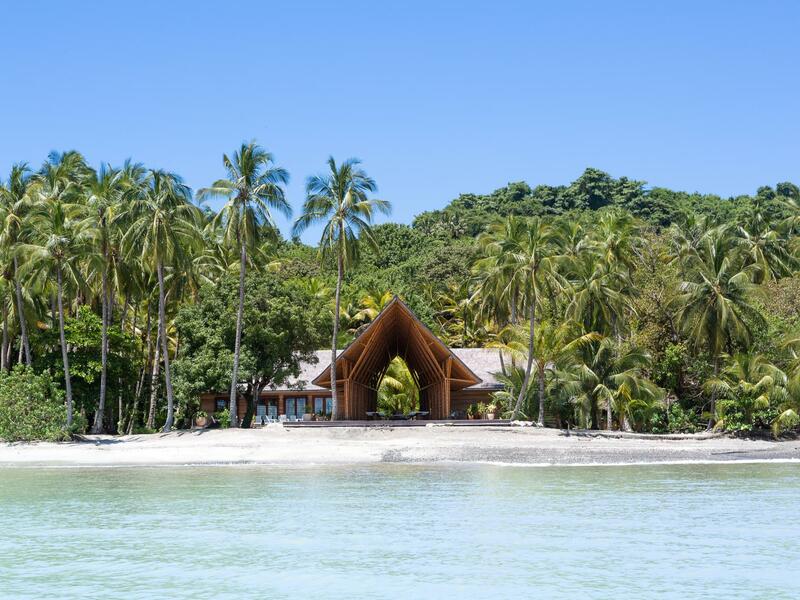 Good for groups: the group getaway of a lifetime, complete with whale watching, mangrove kayaking and diving in Coiba National Park. 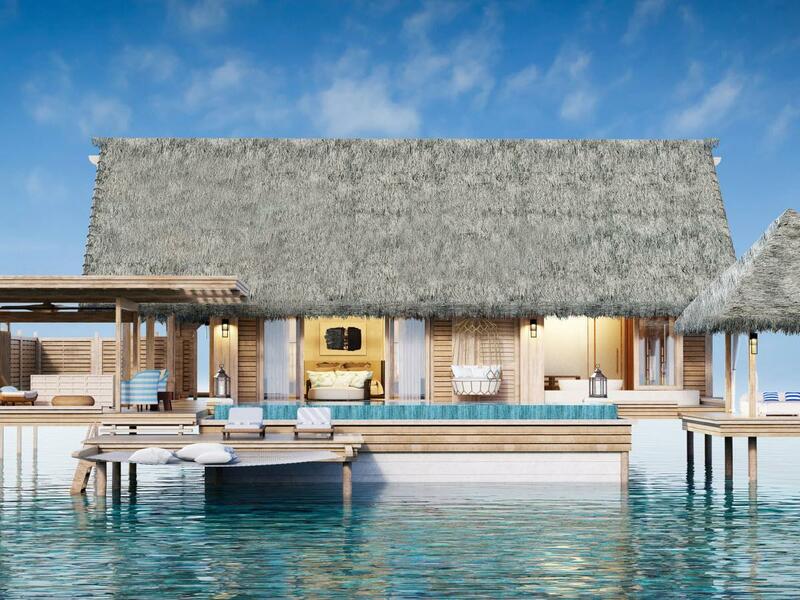 Scheduled to open this summer, the new Waldorf Astoria in the Maldives has all the ingredients of a secluded luxury getaway: overwater villas, beach bungalows, overwater spa villas, multiple indoor and outdoor dining venues, and of course, white sand beaches. 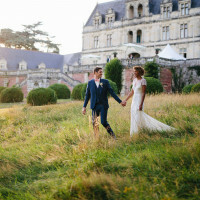 Good for groups: weddings at this property will offer the best in luxury and service. 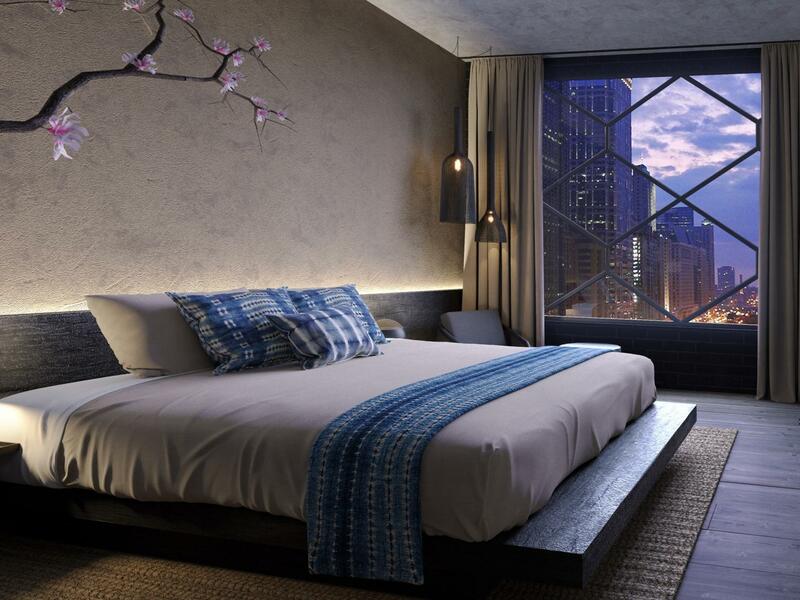 A hotel and restaurant brand known for its impeccable service, beautifully designed spaces and fabulous locations, Nobu is coming soon to Chicago’s West Loop. Rumored to open later this year (exact dates TBC), a ground level restaurant with indoor and outdoor space will open right out to Restaurant Row. On the floors above, 103 rooms and suites as well as a rooftop bar and restaurant will be part of the experience. Good for groups: details are yet to be released, but we’re crossing our fingers for a wedding and event space up on that rooftop! 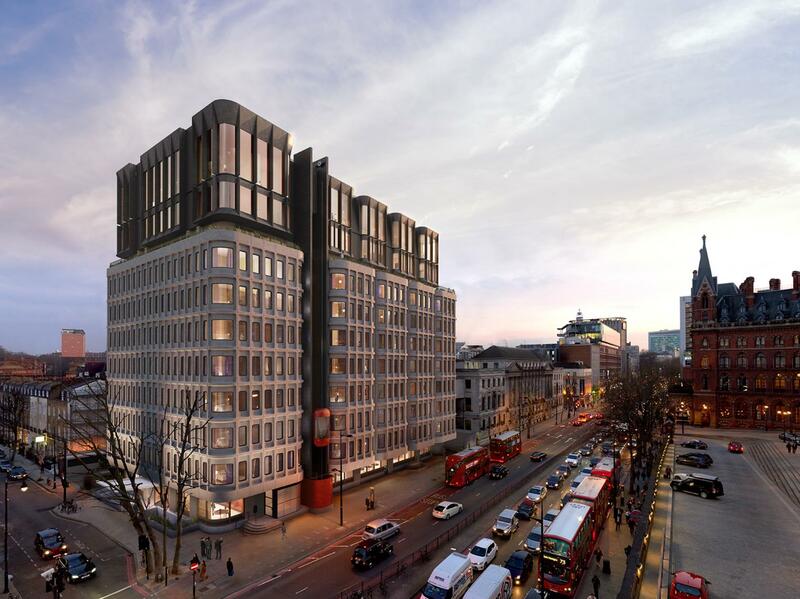 Slated to open in Kings Cross this year, The Standard London will be home to 266 guest rooms, a number of outdoor terraces and a rooftop restaurant that boasts sweeping city views. 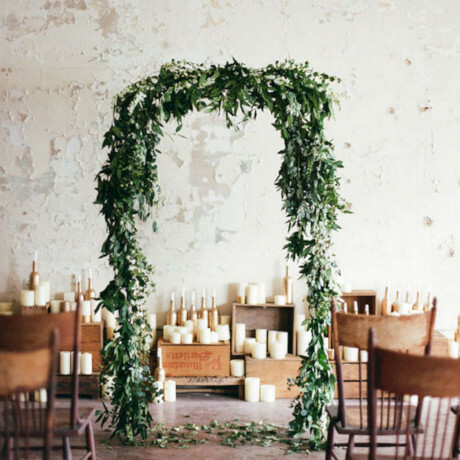 Good for groups: event spaces and options have yet to be announced, but we’re gonna bet they’ll be stylish and up for any type of event you can dream up. 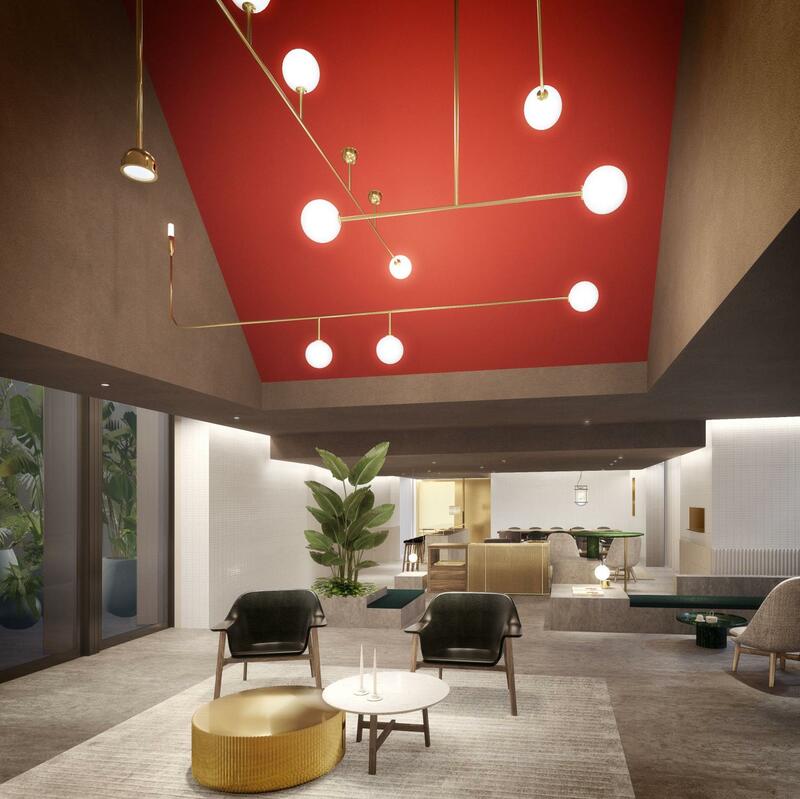 A luxury hot spring resort with Japanese-style thermal water baths and spa treatments is set to open in April 2019 in the valley northwest of Taichung. 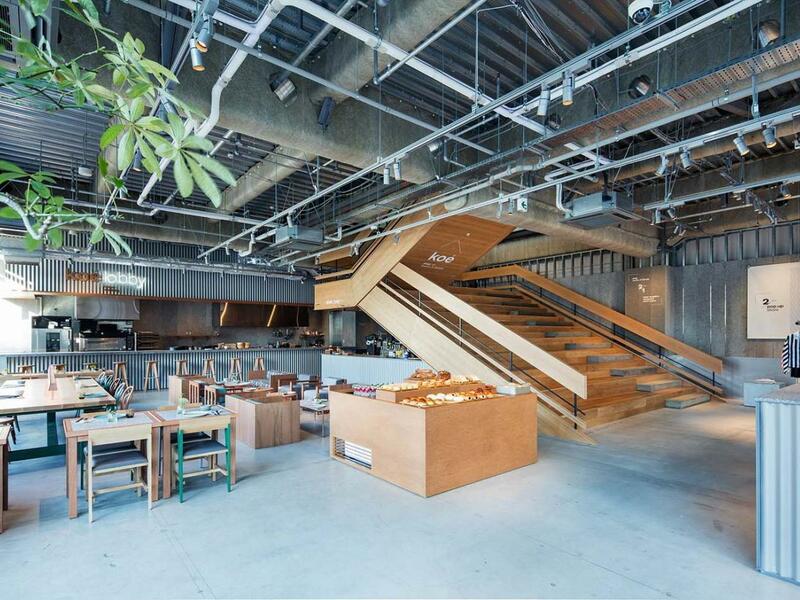 The focus here is minimalism, encouraging guests to simply engage with their environment. 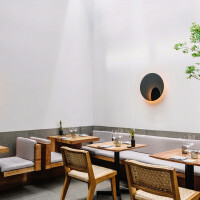 Good for groups: groups in search of a life-changing wellness experience will love this spot and its terrace restaurant overlooking the water garden that can accommodate small groups for Japanese fare with a Taiwanese spin.